Venice is a city in northeastern Italy and the capital of the Veneto region. It is situated across a group of 117 small islands that are separated by canals and linked by bridges. These are located in the marshy Venetian Lagoonwhich stretches along the shoreline, between the mouths of the Po and the Piave Rivers. Parts of Venice are renowned for the beauty of their settings, their architecture, and artwork. The lagoon and a part of the city are listed as a World Heritage Site. In 2009, 270,098 people resided in Venice's comune (the population estimate of 272,000 inhabitants includes the population of the whole Comune of Venezia; of whom around 60,000 live in the historic city of Venice (Centro storico); 176,000 in Terraferma (the mainland), mostly in the large frazioni (roughly equivalent to "parishes" or "wards" in other countries) of Mestre and Marghera; and 31,000 on other islands in the lagoon). Together with Padua and Treviso, the city is included in the Padua-Treviso-Venice Metropolitan Area (PATREVE), with a total population of 2,600,000. PATREVE is only a statistical metropolitan area without any degree of autonomy. The name is derived from the ancient Veneti people who inhabited the region by the 10th century BC. The city was historically the capital of the Republic of Venice. Venice has been known as the "La Dominante", "Serenissima", "Queen of the Adriatic", "City of Water", "City of Masks", "City of Bridges", "The Floating City", and "City of Canals". The Republic of Venice was a major maritime power during the Middle Ages and Renaissance, and a staging area for the Crusades and theBattle of Lepanto, as well as a very important center of commerce (especially silk, grain, and spice) and art in the 13th century up to the end of the 17th century. This made Venice a wealthy city throughout most of its history. It is also known for its several important artistic movements, especially the Renaissance period. After the Napoleonic Wars and theCongress of Vienna, the Republic was annexed by the Austrian Empire, until it became part of theKingdom of Italy in 1866, following a referendum held as a result of the Third Italian War of Independence. Venice has played an important role in the history of symphonic and operatic music, and it is the birthplace of Antonio Vivaldi. Venice is one of the most important tourist destinations in the world for its celebrated art and architecture.The city has an average of 50,000 tourists a day (2007 estimate). In 2006, it was the world's 28th most internationally visited city, with 2.927 million international arrivals that year. It is regarded as one of the world's most beautiful cities. Today, there are numerous attractions in Venice, such as St Mark's Basilica, theGrand Canal, and the Piazza San Marco. The Lido di Venezia is also a popular international luxury destination, attracting thousands of actors, critics, celebrities, and mainly people in the cinematic industry. The city also relies heavily on the cruise business. The Cruise Venice Committee has estimated that cruise ship passengers spend more than 150 million euros (US $193 million) annually in the city. However, Venice's popularity as a major worldwide tourist destination has caused several problems, including the fact that the city can be very overcrowded at some points of the year. It is regarded by some as a tourist trap, and by others as a "living museum". Unlike most other places in Western Europe, and the world, Venice has become widely known for its element of elegant decay. The competition for foreigners to buy homes in Venice has made prices rise so high that numerous inhabitants are forced to move to more affordable areas of Veneto and Italy, the most notable being Mestre. The need to balance cruise tourism revenues with the protection of the city's fragile canals has seen the Italian Transport Ministry attempt to introduce a ban on large cruise ships visiting the city. The ban would only allow cruise ships smaller than 40,000-gross tons to enter Venice’s Giudecca Canal and St Mark's basin. In January, a regional court scrapped the ban, but global cruise lines indicated that they would continue to respect it until a long-term solution for the protection of Venice is found. The city considered a ban on wheeled suitcases, but settled on banning hard wheels for cargo from May 2015. Although no surviving historical records deal directly with the founding of Venice, tradition and the available evidence have led several historians to agree that the original population of Venice consisted of refugees from Roman cities near Venice such as Padua, Aquileia, Treviso, Altino and Concordia (modern Portogruaro) and from the undefended countryside, who were fleeing successive waves of Germanic and Hun invasions. Some late Roman sources reveal the existence of fishermen on the islands in the original marshy lagoons. They were referred to as incolae lacunae ("lagoon dwellers"). The traditional founding is identified with the dedication of the first church, that of San Giacomo on the islet of Rialto (Rivoalto, "High Shore") — said to have taken place at the stroke of noon on 25 March 421 (the Feast of the Annunciation). Beginning as early as AD 166 to 168, the Quadi and Marcomanni destroyed the main center in the area, the current Oderzo. The Roman defences were again overthrown in the early 5th century by the Visigoths and, some 50 years later, by the Huns led by Attila. The last and most enduring immigration into the north of the Italian peninsula, that of the Lombards in 568, left the Eastern Roman Empire a small strip of coast in the current Veneto, including Venice. The Roman/Byzantine territory was organized as the Exarchate of Ravenna, administered from that ancient port and overseen by a viceroy (the Exarch) appointed by the Emperor in Constantinople, but Ravenna and Venice were connected only by sea routes; and with the Venetians' isolated position came increasing autonomy. New ports were built, including those at Malamocco and Torcello in the Venetian lagoon. The tribuni maiores, the earliest central standing governing committee of the islands in the Lagoon, dated from c. 568. In 751 the Lombard King Aistulf conquered most of the Exarchate of Ravenna, leaving Venice a lonely and increasingly autonomous Byzantine outpost. During this period, the seat of the local Byzantine governor (the "duke/dux", later "doge"), was situated in Malamocco. Settlement on the islands in the lagoon probably increased with the Lombard conquest of other Byzantine territories, as refugees sought asylum there. In 775/6 the episcopal seat of Olivolo .San Pietro di Castello; Helipolis was created. During the reign of duke Agnello Particiaco (811–827) the ducal seat moved from Malamocco to the highly protected Rialto, the current location of Venice. The monastery of St Zachary and the first ducal palace and basilica of St. Mark, as well as a walled defense (civitatis murus) between Olivolo and Rialto, were subsequently built here. Charlemagne sought to subdue the city to his own rule. He ordered the Pope to expel the Venetians from the Pentapolis along the Adriatic coast, and Charlemagne's own son Pepin of Italy, king of the Lombards under the authority of his father, embarked on a siege of Venice itself. This, however, proved a costly failure. The siege lasted six months, with Pepin's army ravaged by the diseases of the local swamps and eventually forced to withdraw (810). A few months later, Pepin himself died, apparently as a result of a disease contracted there. In the aftermath, an agreement between Charlemagne and the Byzantine Emperor Nicephorus in 814 recognized Venice as Byzantine territory and granted the city trading rights along the Adriatic coast. In 828 the new city's prestige increased with the acquisition of the claimed relics of St Mark the Evangelist from Alexandria, which were placed in the new basilica. (Winged lions, visible throughout Venice, symbolise St Mark.) The patriarchal seat also moved to Rialto. As the community continued to develop and as Byzantine power waned, its autonomy grew, leading to eventual independence. From the 9th to the 12th century, Venice developed into a city state (an Italian thalassocracy or Repubblica Marinara: the other three of these were Genoa,Pisa, and Amalfi). Its strategic position at the head of the Adriatic made Venetian naval and commercial power almost invulnerable. With the elimination of pirates along the Dalmatian coast, the city became a flourishing trade center between Western Europe and the rest of the world (especially the Byzantine Empire and Asia) with a naval power protecting sea routes from Islamic piracy. Venice remained closely associated with Constantinople, being twice granted trading privileges in the Eastern Roman Empire, through the so-called Golden Bulls or "chrysobulls" in return for aiding the Eastern Empire to resist Norman and Turkish incursions. In the first chrysobull, Venice acknowledged its homage to the Empire; but not in the second, reflecting the decline of Byzantium and the rise of Venice's power. Venice became an imperial power following the Fourth Crusade, which, having veered off course, culminated in 1204 by capturing and sacking Constantinople and establishing the Latin Empire. As a result of this conquest, considerable Byzantine plunder was brought back to Venice. This plunder included the gilt bronze horses from the Hippodrome of Constantinople, which were originally placed above the entrance to the cathedral of Venice, St Mark's Basilica, although the originals have been replaced with replicas and are now stored within the basilica. After the fall of Constantinople, the former Roman Empire was partitioned among the Latin crusaders and the Venetians. Venice subsequently carved out a sphere of influence in the Mediterranean known as the Duchy of the Archipelago, and captured Crete. The seizure of Constantinople proved as decisive a factor in ending the Byzantine Empire as the loss of the Anatolian themes after Manzikert. Although the Byzantines recovered control of the ravaged city a half-century later, the Byzantine Empire was terminally weakened, and existed as a ghost of its old self until Sultan Mehmet The Conqueror took the city in 1453. Situated on the Adriatic Sea, Venice always traded extensively with the Byzantine Empire and the Muslim world. By the late 13th century, Venice was the most prosperous city in all of Europe. At the peak of its power and wealth, it had 36,000 sailors operating 3,300 ships, dominating Mediterranean commerce. Venice's leading families vied with each other to build the grandest palaces and support the work of the greatest and most talented artists. The city was governed by the Great Council, which was made up of members of the noble families of Venice. The Great Council appointed all public officials and elected a Senate of 200 to 300 individuals. Since this group was too large for efficient administration, a Council of Ten (also called the Ducal Council or the Signoria), controlled much of the administration of the city. One member of the great council was elected "Doge", or duke, the chief executive, who usually held the title until his death; although several Doges were forced by pressure from their oligarchical peers to resign and retire into monastic seclusion when they were felt to have been discredited by political failure. The Venetian government structure was similar in some ways to the republican system of ancient Rome, with an elected chief executive (the Doge), a senate-like assembly of nobles, and a mass of citizens with limited political power, who originally had the power to grant or withhold their approval of each newly elected Doge. Church and various private properties were tied to military service, although there was no knight tenure within the city itself. The Cavalieri di San Marco was the only order of chivalry ever instituted in Venice, and no citizen could accept or join a foreign order without the government's consent. Venice remained a republic throughout its independent period, and politics and the military were kept separate, except when on occasion the Doge personally headed the military. War was regarded as a continuation of commerce by other means (hence, the city's early production of large numbers of mercenaries for service elsewhere, and later its reliance on foreign mercenaries when the ruling class was preoccupied with commerce). Although the people of Venice generally remained orthodox Roman Catholics, the state of Venice was notable for its freedom from religious fanaticism and executed nobody for religious heresy during the Counter-Reformation. This apparent lack of zeal contributed to Venice's frequent conflicts with the Papacy. In this context, the writings of the Anglican divine William Bedell are particularly illuminating. Venice was threatened with the interdict on a number of occasions, and twice suffered its imposition. The second, most famous, occasion was in 1606, by order of Pope Paul V.
The newly invented German printing press spread rapidly throughout Europe in the 15th century, and Venice was quick to adopt it. By 1482, Venice was the printing capital of the world, and the leading printer was Aldus Manutius, who invented paperback books that could be carried in a saddlebag. His Aldine Editions included translations of nearly all the known Greek manuscripts of the era. Venice's long decline started in the 15th century, when it first made an unsuccessful attempt to hold Thessalonica against the Ottomans (1423–1430). It also sent ships to help defend Constantinople against the besieging Turks (1453). After Constantinople fell to Sultan Mehmet II, he declared war on Venice. The war lasted thirty years and cost Venice much of its eastern Mediterranean possessions. Next, Christopher Columbus discovered the New World in 1492. Then Vasco da Gama of Portugal found a sea route to India by rounding the Cape of Good Hope during his first voyage of 1497-99, destroying Venice's land route monopoly. France, England and the Dutch Republic followed. Venice's oared galleys were at a disadvantage when it came to traversing the great oceans, and therefore Venice was left behind in the race for colonies. The Black Death devastated Venice in 1348 and once again between 1575 and 1577. In three years, the plague killed some 50,000 people. In 1630, the Italian plague of 1629–31 killed a third of Venice's 150,000 citizens. Venice began to lose its position as a center of international trade during the later part of the Renaissance as Portugal became Europe's principal intermediary in the trade with the East, striking at the very foundation of Venice's great wealth; while France and Spain fought for hegemony over Italy in the Italian Wars, marginalising its political influence. However, the Venetian empire was a major exporter of agricultural products and, until the mid-18th century, a significant manufacturing center. During the 18th century, Venice became perhaps the most elegant and refined city in Europe, greatly influencing art, architecture and literature. But the Republic lost its independence when Napoleon Bonaparte conquered Venice on 12 May 1797 during the First Coalition. Napoleon was seen as something of a liberator by the city's Jewish population, although it can be argued they had lived with fewer restrictions in Venice. He removed the gates of the Ghetto and ended the restrictions on when and where Jews could live and travel in the city. Venice became Austrian territory when Napoleon signed the Treaty of Campo Formio on 12 October 1797. The Austrians took control of the city on 18 January 1798. But Venice was taken from Austria by the Treaty of Pressburg in 1805 and became part of Napoleon's Kingdom of Italy; however it was returned to Austria following Napoleon's defeat in 1814, when it became part of the Austrian-held Kingdom of Lombardy-Venetia. In 1848–9, a revolt briefly re-established the Venetian Republic under Daniele Manin. In 1866, after the Third Italian War of Independence, Venice, along with the rest of the Veneto, became part of the newly created Kingdom of Italy. During the Second World War, the historic city was largely free from attack, the only aggressive effort of note being Operation Bowler, a successful Royal Air Force precision strike on the German naval operations in the city in March 1945. The targets were destroyed with virtually no architectural damage inflicted on the city itself. However the industrial areas in Mestre and Marghera and the railway lines to Padua, Trieste and Trento were repeatedly bombed. On 29 April 1945, New Zealand troops under Freyberg of the Eighth Army reached Venice and relieved the city and the mainland, which were already in partisan hands. July and August may be the worst time to visit: it's sometimes very hot and often humid, there are mosquitoes and occasional infestations of flies, and there are a LOT of tourists and large crowds anywhere you go. Spring and autumn are probably best, a compromise between temperature (expect 5-15°C in March) and the tourist load. Between November and January, you may manage to feel you have Venice all to yourself, an interesting and quiet experience. Beware of the weather during the winter months: it can be quite cold, windy, and damp. Fog is an additional hazard if you are driving in or out, doubly so in the unlikely chance that you will pilot a boat. That said, if you've never been to Venice, it's better to go in summer than not to go. You won't regret it. Many cities are far worse in summer, and Venice has no cars, hence no smog. Acqua alta (high water) has become a fact of life in Venice. The lagoon water level occasionally rises above the level of the squares and streets, flooding them. This can happen several times a year, at irregular intervals, usually in the colder months. Acqua alta usually lasts a few hours and coincides with high tide. You'll see raised walkways in side alleys ready to be pulled out when acqua altahits. When the city begins to flood, sirens will sound to warn residents and businesses. If you speak fluent Italian, tune into news programs since their predictions of the times the flood begins and ends are usually accurate. Normally, the tide rises and falls in six-hour cycles. You can get an acqua alta map at the tourist offices either at the railway station or St Marks. This will show you the higher, dry routes and the ones with walkways set up during the various flood alerts. There is a tide measuring station at the Rialto vaporetto piers, and a noticeboard at the base of the Campanile in the Piazza San Marco that shows a live tide reading and predictions for the next few days. The whole pensolon (municipality) is divided into 6 boroughs. One of these (the historic city) is divided into six areas called sestieri: Cannaregio, San Polo,Dorsoduro (including the Giudecca and Isola Sacca Fisola), Santa Croce, San Marco (including San Giorgio Maggiore) and Castello (including San Pietro di Castello and Sant'Elena). Each sestiere was administered by a procurator and his staff. Nowadays each sestiere is a statistical and historical area without any degree of autonomy. The six fingers or flanges of the ferro on the bow of a gondola represent the six sestieri. The sestieri are divided into parishes – initially 70 in 1033, but reduced under Napoleon and now numbering just 38. These parishes predate the sestieri, which were created in about 1170. Venice's economy has changed throughout history. In the Middle Ages and the Renaissance, Venice was a major center for commerce and trade, as it controlled a vast sea-empire, and became an extremely wealthy European city, a leader in political and economic affairs and a centre for trade and commerce. From the 11th century until the 15th century, pilgrimages to the Holy Land were offered in Venice. Other ports such as Genoa, Pisa, Marseille,Ancona and Dubrovnik were hardly able to make any competition to the well organized transportation of pilgrims from Venice. This all changed by the 17th century, when Venice's trade empire was taken over by other countries such as Portugal, and its naval importance was reduced. In the 18th century, then, it became a major agricultural and industrial exporter. The 18th century's biggest industrial complex was the Venice Arsenal, and the Italian Army still uses it today (even though some space has been used for major theatrical and cultural productions, and spaces for art). Today, Venice's economy is mainly based on tourism, shipbuilding (mainly done in the neighboring cities of Mestre and Porto Marghera), services, trade and industrial exports. Murano glass production in Murano and lace production in Burano are also highly important to the economy. Lido–Pellestrina (also known as Venezia litorale); population: 21,664. The area code is 041. As anywhere in Italy, it is compulsory to dial the area code and the number also if you call from the city itself. If you call from abroad, dial +39041 before the number. If you call abroad from Venice, dial 00 first. Venice has several internet cafes, but they are much more expensive than the rest of Europe with prices for an hour of access around €6. Wi-fi is only available at some of them. There's a wonderful pub, Cafe Blue in Dorsoduro, which has free (password-protected) wi-fi. Buy a spritz and a panini and go to town. At the Telecom Italia Future Centre in Campo San Salvatore (San Marco) you can browse for free for one hour, once registered with your ID card. The city has been steadily building out the municipal WiFi network, which now covers almost the entire area around the Grand Canal and some of the larger squares in the center. You can buy guest access at approximately €5 per day at the same unified Venezia Unica site where the transport and museum passes are sold. To use an Internet cafe, buy a mobile SIM card or get a contract for an Internet connection. Personal identification is needed by law in Italy. Internet cafes will not let you use computers without a passport or national ID card. Calle Delle Botteghe San Marco 2970 Venezia. A very pretty art gallery type internet cafe with a book shop. It is on the expensive side with €3 for 15mins but you can just go in and play chess with a glass of wine. Because Venice is on a lagoon, the water plays a crucial role in transportation. Whichever way you arrive, the last part of your journey will be on foot from the nearest waterbus/watertaxi jetty. If you need to carry or wheel bags along the narrow streets, bear this in mind when choosing your hotel location and route to it. The closest commercial airport is Marco Polo Airport (IATA: VCE), on the mainland near Mestre (a more typical Italian city, without Venice's unique structure). There is a city bus and a shuttle bus from Marco Polo to Piazzale Roma. See the details in the By Bus section below. There are direct flights to and from Amsterdam, Atlanta, Barcelona, Basel, Berlin, Bilbao, Birmingham, Bordeaux, Brussels, Bucharest, Casablanca, Chisinau, Cologne, Copenhagen, Doha, Dubai, Dublin, Dubrovnik, Duseldorf, Edinburgh, Eindhoven, Frankfurt, Geneva, Glasgow, Hamburg, Istanbul, Leeds Le Havre, Lille, Lisbon, London, Luxemburg, Madrid, Manchester, Mars Alam, Marseille, Metz, Montreal, Moscow, Munich, Mykonos, Nantes, New York. Newcastle, Nice, Oslo, Paris, Philadelhia, Praguem Pristina, Riga, Southend, St.Petersburg, Sharm el-Sheik, Stuttgart, Timisoara, Tirana, Toronto, Toulose, Tunis, Vienna, Warsaw and Zurich as well as domestic flights to and from Bari, Brindisi, Cagliati, Catania, Lamzea Terme, Naples, Olbia, Palermo, Reggio Calabria and Rome. XL Airways France, tel. +33 3 22192504. ATVO operates a bus service from Piazzale Roma to Marco Polo Airportin summer at 5.00 and 5.40, from 6.20 to 20.50 every 30 minutes, last bus at 21.10, and from Marco Polo Airport to Piazzale Roma from 7.50 to 0.20. The trip takes about 20 minutes, Ticket price € 6.00 one-way, € 11.00 return. Tickets can be bought at the airport at the automatic ATVO ticket machine in the arrivals baggage hall, at the ATVO ticket counter in the arrival hall (open from 8.00 to 23.45m, tel +39 042 1594672) and the automatic ATVO ticket machine outside the airport on the ATVO departure platform. In Venice tickets can be bought at the ATVO ticket office in Piazzale Roma, ear the Carabinieri station ( (tel +39 421 594 671), at automatic ATVO ticket machine outside the ticket office, at 'Chiosco di Pluff' newsagent in the center of the square 5 metres from the depature point for the buses to San Marco Airport, at Botazzo Tobaconist's in Piazzale Roma, at the Novo Tour Agency in Piazzale Roma and at IEX Change Agency in St.Mark's Square under the Torre dei Mori. In Mestre tickets can be bought at ATVO ticket office in Via Capuccina 183, near the railway station (tel +39 421 594 673), at automatic ticket machine outside the ticket office, at Bar Binario, situated near the ticket office, at ATAV - Associazione Turistica Albergatori Venezia, inside the railway station or at 365 Grandi Biglietterie Agency inside the railway station. Blue line (linea blu) runs from the Airport to the Cruise Terminal (Terminal Crociere) via Murano, Fondamente Nove, Ospedale, Bacini, Lido, Arsenale. S.Zaccharia, Zitelle, Zattere and Giudecca Stucky. Boats leave from the airport every hour from 6.10 to 8.10 and from 20.15 to 00.15 amd from 8.45 to 20.15 every 30 minutes, boats leave from Cruise Terminal (Terminal Crociere) every 30 minutes from 7.50 to 17.20. Orange line (linea arancio) connects the Airport with Giglio via Orto, Guglie, S.Stae, Rialto, SAngelo and Ca' Rezzonico and vice versa. Boats leave from the airport every 30 mins from 8.00 to 19.00. Boats leaving later in the evening go to Fondamenta Nove or S.Marco only. Boats leave from Giglio from every 30 minutes from 6.48 to 18.48, later boats leave from San Marco only. Red line (Linea rossa) goes from the Airport to San Marco via Murano Museo, Certosa and Lido. Boats leave the airport every hour from 10.30 to 18.30 and San Marco every hour from 9.05 to 19.05. Ticket price Airport to Lido or Cruise Terminal or vice versa is € 15.00 one way, € 27.00 return, € 8.00 IMOB, Airport to Murano or vice versa € 8.00 one way, € 15.00 return, € 4.00 IMOB, Cruise Terminal to Venezia centre or vice versa € 8.00 one way, € 15.00 return, € 4.00 IMOB , Cruise Terminal to Lido or Murano or vice versa € 10.00 one way, € 18.00 return, € 8.00 IMOB and San Marco to Lido or Murano € 8.00 one way, € 15.00 return, € 5.00 IMOB. There are also tourist tickets (24 hours € 30.00, 72 hours € 65.00. Alternatively, from the same jetty, you can travel in style (and much faster) by hiring one of the speedy water-taxis (30 mins) for about €110. All these tickets are now buyable online, as well as the airport waterbus route map. If you are departing from Marco Polo and have some time to kill post-security, you'll find that the airport is flooded with expensive paid Wi-Fi; the trick here is to go up to the second floor (food court), on the left (looking from the front) escalator, and set camp near the left wall. You will be next to the Alitalia lounge, where Wi-Fi is free (the network SSID is "RDN for Alitalia"). The closer you are to the wall, the better the reception, but even that little nook with a couple of tables (grab an espresso at the counter before sitting down - it's very passable and not outrageously expensive) should be within range. The Treviso Airport (IATA: TSF), located 25 km (16 mi) from Venice, is relatively smaller but becoming increasingly busy as the main destination for Ryanair, Wizzair, and Transavia budget flights. There are flights to Treviso Airport from Barcelona, Bremen, Brussels. Bucharest , Charleroi, Chisinau, Cluj, Dublin, Düsseldorf weeze, East Midlands, Eindhoven, Frankfurt Hahn, Iasi, Kiev, Leeds, London Stansted, Lwow, Malta, Paris Beauvais, Prague, Skopje, Stockholm Timisoara and Valencia as well as domestic flights from Alghero, Bari, Brindisi, Cagliari, Catania, Lamezia Terme and Palermo. Flights to and from Treviso Airport are operated by Ryanair, tel. 895 8958989 and Wizz Air tel. 895 895 3322. From Treviso Airport to Venice and Mestre, Barzi Bus Service offers an €18 round-trip ticket price from-to Mestre train station and Venice Tronchetto. Barzi Bus offers a bus service from Treviso Airport on the motorway to Venezia Mestre Railway Station and Venice Tronchetto. Ticket price € 10.00 one way, € 18.00 return (valid 10 days). Tickets can by bought at Barzi Busservice Airport desk in the arrival hall (tel. +39 348 836 71 85), or on the bus. Tickets bought on Ryanair flights are not valid for this service. Barzi Bus brings you to Tronchetto, from there you can take vaporetto line 2 to the city center..
ATVO operates buses from Venice to Treviso Airport daily at 5.30, 7.10, 10.30, and 18.30 and from Treviso Airport to Venice daily at 7.45, 8.15, 13.10 and 21.20 plus others not connecting to the flights to and from Treviso Airport. Ticket price € 7.00 one way. € 13.00 return (valid 7 days). Flights arriving earlier or later than scheduled may affect the departure from the airport. If flights are cancelled the bus service will be suspended. The bus has two stops in Mestre, one in Corso del Popolo in front of BNP Bank in the historic center and the other one near the railway station. Tickets can be bought at Treviso Airport at the automatic ATVO ticket machine in the arrivals baggage hall or the ATVO ticket office in the arrivals hall, operating from 7.30 to 22.30 (tel +39 422 315 381). In Venice tickets can be bought at the ATVO ticket office in Piazzale Roma, near the Carabinieri station (tel +39 421 594 671), at automatic ATVO ticket machine outside the ticket office, at 'Chiosco di Pluff' newsagent in the center of the square 5 metres from the departure point for the buses to Treviso Airport, at Botazzo Tobaconist's in Piazzale Roma, at the Novo Tour Agency in Piazzale Roma and at IEX Change Agency in St.Mark's Square under the Torre dei Mori. In Mestre tickets can be bought at ATVO ticket office in Via Capuccina 183, near the railway station (tel +39 421 594 673), at automatic ticket machine outside the ticket office, at Bar Binario, situated near the ticket office, at ATAV - Associazione Turistica Albergatori Venezia, inside the railway station or at 365 Grandi Biglietterie Agency inside the railway station. The San Nicolo Airport (ICAO:LIPV, no IATA code) is an airfield directly on the Lido. It handles only small aircraft, as the runway (grass) is about 1 km long, and does not have any scheduled flights, but might be of interest to private pilots (arrivals from Schengen states only) due to its convenience to the city (it is a short walk to the vaporetto landing). Trains from the mainland run through Mestre to the Venezia Santa Lucia train station on the west side of Venice; make sure you don't get confused with Venezia Mestre which is the last stop on the mainland. Many through trains only stop in Mestre - in that case just hop on to one of the very frequent trains to Santa Lucia (Ticket 1.25€). Also, ACTV has a ticket office at Mestre station, and queues might be shorter here. From the Santa Lucia station district, water buses (vaporetti) or water taxis can take you to hotels or other locations on the islands, but walking is usually the best option. Direct trains to Venice are available from many international destinations, there are overnight trains from Munich, Paris and Vienna and also a weekly long-distance night train (four nights) from Moscow via Kiev, Budapest and Zagreb. Eurocity trains to Munich depart at 13.34 and arrive in Munich at 20.14, Euronight trains to Vienna depart at 20.57 and arrive in Vienna at 8.08 next morning, Euronight trains to Paris depart at 20.01 and arrive in Paris at 9.30 of the next morning. Venice is well-connected with the domestic train network, Rome and Milano are only a few hours away. Also there are some night trains from cities in southern Italy, though since 2012 most services have been canceled. Freccia Bianca (White Arrow) trains to Trieste leave from Venezia Mestre at 10.24, 19.45 and 21.59 and the trip takes about 1 hr 35 mins. Regionale Veloce (Fast Regional) trains leave from Santa Lucia station at 9.11, 9.48, 12.09, 13.09, every hour from 14.11 to 18.11, at 19.35 hrs, the trip taking about 2 hrs 5 mins. Freccia Bianca (White Arrow) trains to Milano leave Santa Lucia station at 5.20, 6.20, 6.50, 7.50, 8.50, 10.50, 12.50, 13.20, 14.20, 14.50, 15.20, 16.20, 17.20, 18.20 and 19.50, duration of the trip is about 2 hrs 35 mins. There are Freccia Argento (Silver Arrow) trains to Rome leaving Santa Lucia at 10.25, 13.25, 15.25 and 18.25, via Bologna and Florence arriving in Rome 3 hrs 50 mins later, and an Intercity Night train leaving Santa Lucia at 0.07, arriving in Rome at 6.35 next morning. Iitalo offers train services from Santa Lucia to Rome at 7.55, 9.55, 12.55 and 18.55, arriving Romea Ostiense at 11.50, 13.50, 16.50 and 22.50 as well as at 15.55. arriving at Roma Tiburtina at 19.30. Also, Venice is the terminus for the luxurious Venice Simplon Orient-Express, a historical train that still make the overnight journey from London and Paris in original 1920s coaches. There are departures at least once a week between March and November. As one of the most sumptuous journeys in the world, the trip is expectedly very expensive, starting at €2,900. Cars arrive on the far western edge of Venice, but remain parked at the entrance to the city (Piazzale Roma or Tronchetto - Europe's largest car park.) There are no roads past this point—and never were, even before cars. Car parking is very very expensive here (26 €/12h, 30 €/24h) and the tailbacks can be quite large. Tronchetto is about a 1 km from Piazzale Roma, the city's main entry point, but there is an shuttle train service, People Mover, at 1.50 €. Parking Tronchetto Isola Nuovo del Tronchetto, Email: [email protected], Tel: +39 041 5207555, Fax: +39 041 5285750, has 4.000 parking lots (including 33 parking lots for persons with special needs). Parking is open 24 hours throughout the year. Cars must not be higher than 2.10 meters. Ticket price is € 3.00 per hour for the first 2 hours, € 5.00 per hour for the next 2 hours and € 21.00 for the whole day. Most credit cards are accepted. Autorimessa Comunale, PIAZZALE ROMA, Santa Croce 496, tel. +39 041-27.27.211 , GPS 45°26'19.75" N - 12°19'01.71" E; offers parking for more than 2000 cars and 300b motor-cycles on 6 floors, open 24 hours every day of the year. Cars must not exceed a height of 2,20 meters. The ticket price is € 26.00 for cars under 1,85 meters and € 29.00 for cars over 1,85 meters., online bookings at this website get 10 percent discount. You can download a map how to reach the Autorimessa here. S. Andrea car park PIAZZALE ROMA, Tel. +39 041 – 2727304, GPS 45°26'16.54" N - 12°19'01.88" E; inside the Autorimessa, accessible from Rio Terà S. Andrea, for short term parking.open 24 hours every day all the year round. Cars must not be higher than 2 meters. The ticket price is € 7.00 for 2 hours. No advance reservation. You can download a map how to reach the S. Andrea car park. An alternative is to use the car parks on the mainland (terra ferma) and catch a train or bus or vaporetto into Venice. Park near the Mestre railway station, and catch a train to Venezia St.Lucia; there are many trains, it is very near (8–10 minutes) and quite cheap (€ 1,20). Don't bother searching for free parking near Mestre train station - there are no free parking spots near, except on Sunday (free parking is on the other side of the station, in Marghera). Free and safe parkings are also near Mogliano Veneto and Oriago railway stations. Besides, Venezia St. Lucia is a good starting point to visit Venice. However drivers going to the Lido can use the car ferry from Tronchetto (vaporetto 17 - frequencies vary), right hand lane off the Ponte della Libertà into the city. Ca' Marcello car park, via Ca' Marcello, Mestre, open air car park for 100 cars near the Mestre railway station, open every day from 6am to midnight. Ticket price € 1.00 for 4 hours, € 4.00 for the whole day (on week-days from 8am to 8pm only). Red line (line Rossa) runs from Fusina to Alberoni on Venice Lido in winter Mon to Fri at 7.30, every day at 9.30, 11.30, 13.30, 15.30 and 17.30. travel time 35 minutes, return Mon to Fri 8.15, every day at 10.15, 12.15, 14.15, 16.15 and 18.45. Ticket price € 7.00 one-way, € 12.00 return. Yellow Line (Line gialla) runs from Zattere to Alberoni at 8.45, 10.45, 12.45, 16.15 and 18.15, return from Alberoni at 9.30, 11.45, 13.45, 17.00 and 19.00, tickets € 7.00 one-way, € 12.00 return. Punta Sabbioni: ACI [www], Via Fausta, Cavallino Treporti, tel. +39 0415301096, Mail: [email protected] operates a large car park for 100 busses and 400 cars at Punta Sabbioni. This is a convenient way to enter Venice from the seaside resorts Lido di Jesolo, Lignano or Bibione. Vaporetto line 12 brings you to Murano, Burano and Torcello, lines 14 and 15 to S.Zaccaria. Most of the major rental car companies have outlets at Piazzale Roma, at the edge of the city. These are on the ground floor of one of the major parking stations. When you are dropping off your car, you need to find street parking and then walk to the rental car outlet and hand in the keys. Do not park in the parking station! There is a vaporetto stop across the road from the parking station. There is a direct bus between Marco Polo airport and the Piazzale Roma, on the west bank of Venice operated by ATVO. Starts twice an hour, takes 20 minutes and costs €5. The Piazzale Roma bus station is well served by vaporetti and water-taxis ... and of course, you can walk everywhere. From Mestre, you can take a bus to Venezia- Piazzale Roma. the ticket is €1.30 but if you buy it in the bus it will cost €2.50. You can buy bus tickets from specialized ticket kiosks and vending machines, as well as tobacconists and newsstands. All of the city is connected to Venice by bus. Ships arrive at the Stazione Marittima which is at the west end of the main islands, it is served by vaporetti and water taxis. To Piazzale Roma: take the People Mover operating every 3 minutes weekdays from 7.10 to 22.50, holidays from 8.10 to 21.50, price € 1. To Santa Lucia Railway Station (distance 1 km): take the People Mover to Piazzale Roma, then walk or take the water taxi (tel. +39 0412402711, +39 041716922, +39 0415222303 or +39 0415229040).To Venezia Mestre Railway Station (distance 7 km) take a taxi (Radiotaxi tel. +39 041 5952080 or take the People Mover to Piazzale Roma and the bus line to Mestre. To Marco Polo Airport (distance 13 km) take a taxi (Radiotaxi tel. +39 041 5952080, 40 minutes trip), a water taxi (tel. +39 0412402711, +39 041716922, +39 0415222303 or +39 0415229040) or take the Polple Mover to Piazzale Roma and then ACTV bus no 6 or ATVO busses. Venice, the world's only pedestrian city, is easily walkable, and the absence of cars makes this a particularly pleasant experience. However, walking and standing all day can also be exhausting, so it is best to pace yourself. The Rialtine islands - the 'main' part of Venice - are small enough to walk from one end to the other in about an hour, provided you don't get lost (a common occurrence). If you want to get around a bit more quickly, there are numerous vaporetti (water buses) and water taxis. The vaporetti are generally the best way to get around, even if the service route map changes frequently. If you are going to be in Venice for a few days visiting, it is a lot cheaper to use vaporetti than private water taxis. If you want to have a romantic ride along the canals, take a gondola ride, although they tend to exist for more scenic purposes, rather than getting people from point A to point B.
ACTV runs the vaporetti and other public transport services both in the lagoon and on terra firma. Travel cards are extremely useful since the basic fare for one vaporetto journey is typically €7.50 whereas a 1 day travel card costs €20, 2 day card is €30, a 3 day costs €40 and finally a 7 day pass costs €60. There are other versions available, including those offering discounts for youth under 29 year of age. Current rates can be found here. Line 1 runs from Piazzale Roma to Lido, passing the Railway Station (Ferrovia), Canal Grande, Rialto, S.Marco and S.Zacharia and vice versa, leaving Piazzale Roma every 20 minutes from 5.01 to 6.01 and from 22.21 ro 23.41, every 10 minutes from 6.21 to 22.01, leaving Lido every 20 minutes from 4,16 to 5,36 and from 21.46 to 23.06, every 10 minutes from 5.56 to 21.26. 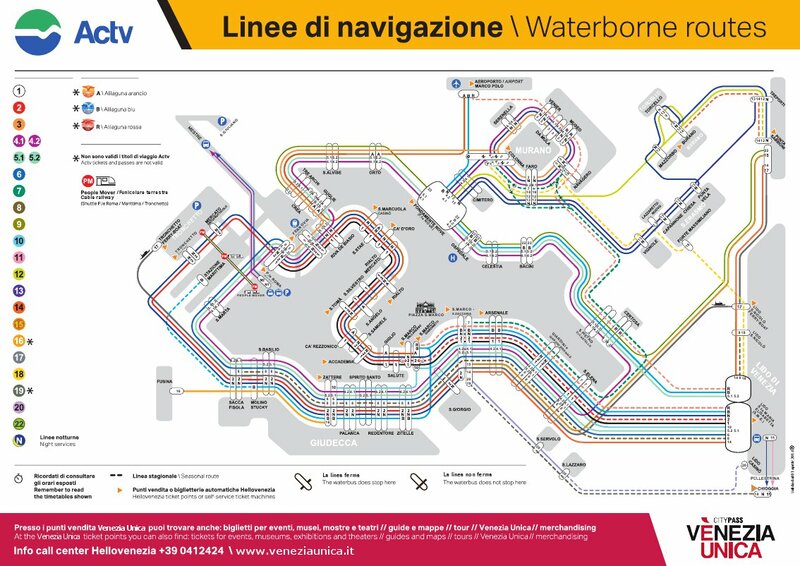 Line N is a night line, connecting Lido with Canal Grande, Piazzale Roma, Tronchetto, Canale and vice versa. Boats leave Lido every 20 minutes from 23.26 to 4.06 and Piazzale Roma every 20 minutes from 0.09 to 4.49. Line 2 goes from S.Zaccharia over S.Girgio, Giudecca, Zattere, Tronchetto, Piazzale Roma, Ferrovia, S.Marcuola, Rialto, S.Tomà, S.Samuele, Academia and S.Marco. Departure from S.Zaccharia every 20 minutes from 4.59 to 8.39 and from 20.49 to 23.09, every 10 minutes from 8.59 to 20.29. Line 4.1 runs from San Zaccaria (Jolanda) to Murano via Arsenale, Giardini, S.Elena, S.Pietro di Castello, Bacini, Celestia, Ospedale. Fondamente Nove and Cimiterio and from Murano to San Zaccaria (Jolanda) via Cimeterio, Fondamente Nove, Orto, Sant’Alvise, Tre Archi, Gugle, Ferrovia, Piazzale Roma, S.Marta, Palanca, Redentore and Zitelle. Boats leave Fondamente Nove to Murano (Museo) from 6.14 to 21.34 and from 21.42 to 23.22, from Murano (Museo) to Piazzale Roma from 6.32 to 19.32, from Murano (Museo) to Fondamente Nove from 19.52 to 21.52 and from Piazzale Roma to San Zaccaria from 6,18 to 20.18 every 20 minutes. Line 4.2 runs from San Zaccaria (Jolanda) to Murano via Zitelle, Redentore, Palanca, Sacca Fisola, S.Marta, Piazzale Roma, Ferrovia, Guglie, Crea, S.Alvise, Orto, Fondamente Nove and Cimeterio, and return from Murano to San Zaccaria (Jolanda) via Cimeterio, Fondamente Nove. Ospedale, Celestia, Bacini, S.Elena, Giardini and Arsemale. Boats depart at San Zaccaria from 6.13 to 20.33, from Piazzale Roma to Fondamente Nove from 6.56 to 20.56, from Fondamente Nove to Murano from 6.23 to 21.23, from Murano (Museo) to San Zaccaria from 6.43 to 20.43, and from Murano (Museo) to Fondamente Nove from 20.43 to 21.43 and from 22.07 to 23.47 every 20 minutes. Line 5.1 runs anti-clockwise from Lido to Piazzale Roma via S.Pietro, Bacini, Celetstia, Ospedale, Fondamente Nove, Orto, S.Alvise, Tre Archi, Guglie, Riva de Biasi and Ferrovia and from Piazzale Roma to Lido via S.Marta, Zattere. S.Zaccaria, Giardini and S.Elenea. Boats leave from Lido from 6.20 to 20.20, from Fondamente Nove from 6.24 to 23.04, from Piazzale Roma from 6.08 to 23.48 and from S.Zaccaria from 6.38 to 0.08 every 20 minutes. Line 5.2 runs clockwise from Lido to Piazzale Roma and back to Lido. Boats leave Lido from 5.52 to 20.32 and from 20.42 to 0.22, from S.Zaccaria from 6.06 to 20.46 and from 20.56 to 0.36, from Piattale Roma from 6.26 to 21.06 and from 21.16 to 23.16 every 20 minutes. Line 6 runs from Piazzale Roma to Lido via S.Marta, S.Basilia, Zattere, Giardini and S.Elena. Boats leave Piazzale Roma from 6.19 to 20.29, and Lido from 5.42 to 20.02 every 20 minutes. Line 9 runs from Burano to Torcello, leaving Burano from 7.05 to 20.35 and Torcello from 6.40 to 20.10 every 30 minutes. Line 10 runs from Lido to San Marco Giardinetti via S.Elena, Giardini, Arsenale and S.Zaccaria and return from San Marco Giardinetti to Lido via S.Zaccaria. Boats from 18.01 to 20,21 and from San Marco Giardinetti from 17.39 to 20.21 every 10 minutes. Line 12 runs from Fondamente Nove to Punta Sabbioni via Murano Faro, Mazzorbo, (Torcello), Burane and Treporti and back. Boats leave Fondamente Nove from 7.10 to 19.40 and Punta Sabbioni from 7.56 to 20.26 every 30 minutes. Line 14, 14L, 15 runs from San Zaccaria Pieta to Punta Sabbioni via Lido and back. Boats leave S.Zaccaria Pietà from 8.15 to 20.15 every 30 minutes, later at varying intervals, last boat at 23.45. Boats leave Punta Sabbioni from 8.30 to 17.00 every 30 minutes, later at varying intervals, last boat at 0.20. Some boats do not stop at Lido. Line 17 is the Tronchetto to Lido (S.Nicoló) ferry. Ferry boats leave at Tronchetto at 0.10, 1.40, and from 6.40 to 23.20 every 50 minutes and Lido (S.Nicoló) at 0,55 and from 5.50 to 23.20 every 50 minutes. A single ticket (biglietto solo andata) costs € 7.50, permitting the use of public transports for 75 minutes from the moment you validate the ticket including transfers heading in the same direction. In case you voard a boat without having bought a tickets beforehand, you have to buy a ticket from the on-board collector upon boarding. There are no return tickets. There are tourist travel cards (biglietto turistico a tempo) for 1, 2, 3, or 7 days. The tourist tickets cost € 20.00 for 24 hours, € 30.00 for 48 hours, € 40.00 for 72 hours and € 60.00 for 7 days. Something you won't be told easily is that now anyone can purchase the Venezia Unica (formerly IMOB) card (the only difference is that in addition to its €10 cost for residents, foreigners need to pay a €30 extra fee). Unless you are in town for a couple of days and planning never to return, do it. It's a durable plastic card with your (webcam) picture, and once you have it, you are more or less a local - which means access to €1.30 single vaporetto tickets (save even more by recharging the card with 10 at once for €11), the same price for #5 ACTV bus to and from the airport, half-price discount on Alilaguna services, and even €0.70 traghetto crossings (instead of €2; flash the card to the gondolier). It is valid for 5 years from the month of issue. Register at the Venezia Unica siteand pre-fill the application online, then go to one of the ACTV offices (not simply ticket points; probably the easiest location is at Piazzale Roma) and tell the clerk that you have a "contratto precompilato" - they'll pull it up, ask you to sign the privacy disclosures and issue the card on the spot (or you can fill the form at the counter; bear in mind it's in Italian). Moreover, if you happen to have a +39 Italian cell phone number, with it and your new Unica you can get a free codefor use of the communal WiFi spots. If you lose the card, do not despair: it costs only €10 to get an immediate replacement, and the balance (along with your old photograph) is automatically transferred over. Since February 2009 the Venice Connected website of the Comune di Venezia (now integrated into Unica site) makes possible to book online (at least 7 days in advance) most services controlled by the town administration (public transportation, access to the civic museums, access to public restrooms, car park tickets, entrance to the Casinò and access to the municipal WiFi network covering the entire historic centre); the online prices vary according to the projected number of visitors but are always cheaper than the current on-site prices (and cheaper than with a Venice Card). You can also get a Venice Card, which has various options that you can choose when you buy it (public transportation, cultural attractions, toilet access, Alilaguna, etc.) There is a 'Junior' version of the Venice that is available at a slightly reduced rate for those between 5 and 29 years of age. Note, however, that a Venice Card is not recommended for those with less than 3 days in Venice, as most of the top attractions are not included in the Venice Card. If you'll be staying in Venice for a week - get the Venice Card and enjoy travelling from island to island and exploring the various museums and churches it offers access to. Maps are available at the vaporetto stops in the ticket booths. The map is quite reliable, and is free when getting a Venice Card (€2 otherwise) can be viewedon Internet. Venice Cards can be reserved on-line for a considerable discount. Keep in mind, though, that there are long lines when taking the Venice Card from the ticket booths. The Venezia St. Lucia ticket booth that offers Venice Cards is the one most on the right when you exit the train station. Otherwise, take a walk! The city is not that big, and you can walk from one end to the other in a few hours (if you stick to the paths conveniently marked with arrows in the direction of major landmarks). But it would take months for a fit person to discover every path in the city. Make sure to visit some of the smaller alleyways, as they can be very interesting. Along the way you will discover marvelous art, superb architecture and breathtaking urban landscaping. Exploring the city randomly by walking is well worth it but also be prepared to get lost easily! Signs all over the city indicate the direction to the main attractions, "Rialto" and "San Marco", as well as the way back to the train station ("ferrovia") and the bus terminal ("Piazzale Roma"). These signs make it easy to have the "get lost experience" even as a one-day tourist. For a faster and safer walk, you should walk on the right side. Be aware that addresses in Venice are of the form DISTRICT NUMBER (The Venetian word for district is "Sestiere"), not STREET NUMBER. To find a specific place using a map, make sure you know which district it is in. The numbers are assigned at the start of the district and increase as they move farther away from the Grand Canal. Water taxis are operated by Coop. San Marco (tel. +39 041 5222303), Coop. Veneziana (tel. +39 041 716124), Coop. Serenissima (tel. +39 041 5221265 or +39 041 5229538), Soc. Narduzzi Solemar (tel. +39 041 5200838), Soc. Marco Polo (tel. +39 041 966170), Soc. Sotoriva (tel. +39 041 5209586), Soc. Serenissima (tel. +39 041 5228538) and Venezia Taxis (tel. +39 041 723009). There are water taxi ranks at Ferrovia (Railway Station) (tel. +39 041716286), Piazzale Roma (S.Chiara) (tel. +39 041716922), Rialto (tel. +39 041723112), Lido (tel. +39 0414222303) and at Marco POlo Airport (tel. +39 0415415084). In the historic city centre there is a fixed tariff for water taxis of € 15.00 at departure plus € 2.00 per minute on urban routes. There are supplements of € 5.00 for call services and customer pick-up outside the taxi ranks, of € 10.00 for night services between 22.00 and 6.00 hrs, of € 3.00 pieces of luggage exceeding 4 pieces and of € 5.00 or € 10.00 for every person exceeding a group of 4. Rates are fixed by a resolution fo the Venice City Council dated May19th 2011 and are viewable here. A water taxi service for persons with special needs is available at +39 041 2747332 or directly through the website Book Taxi Venice. 'Normal' taxis can be called from Radio Taxi (tel. +39 041 936137). There are taxi ranks at Piazzale Roma (tel. +39 041 5237774) and Lido (tel. +39 041 5265974). Ticket price € 2.00 one-way, € 0.70 for Venice residents and IMOB card holders. Alilaguna Green line (linea verde) Alilaguna, tel. +39 041 5235775, operates a 4 hours excursion tour to the island of Murano, Burano and Torcelllo with explanations in English, French, German and Spanish. Departure from imbarcadero San Marco Giardinetti, Minimum 4 participants. Boat starts in Apr, May and Oct at 9.30, 11.00 and 14.30, from Jun to Sept at 9.30, 11.00, 14.30 and 15.30, from Nov to Mar at 11.00 and 14.00. Ticket price € 20,- (free for holders of Alilaguna 72 hrs pass). Atelier Marega. A hand-made mask and costume shop. Fanny (gloves & accessories), Calle dei Saoneri / Campo San Polo 27/23(100m west of Cà Foscari), +39 041 5228266, e-mail:[email protected]. Hundreds of leather gloves in all colours. Francis Model (leather articles), Ruga Rialto / San Polo 773/A (100m SW of Rialto bridge), +39 041 5212889, e-mail:[email protected]. Locally made leather bags. Exceptional craftsmanship. There are reports that some travellers were cheated in this store, by being told that transaction didn't occur while using their credit card, and demanded cash while in fact transaction did occur properly and thus having made the travellers pay for the same item twice. I Tre Mercanti (Wine & Food Gourmet shop), Ponte della Guerra / Castello 5364 (Between Rialto and S.Marco square, near Campo della Guerra), +39 041 522 2901, e-mail: [email protected]. 11:00 - 19:00. Fine Wines & Food. Oil, balsamic vinegar, pasta, sauces and dressings, salami, cheese, sweets, grappa and spirits. A special selection of the best Italian products. They ship to the USA and Worldwide. Well known for their amazing single portion Tiramisù. The shop aims to give customers not only the opportunity to find the best of Italian food and wines all under one roof, but also the chance to have a unique and particular experience where the customer is taken on a path of discovery. This not only includes the Italian food traditions but also cutting edge creations that you can find among the 1500 products displayed on the shelves. The store has a strong international vocation, planned to receive people from everywhere in the world and to ship back to their home every product they need. They can supply yachts as well as make exclusive gift packages or hampers for companies. Venetian Emporium. Venetian masks, Venetian glass chandeliers, Venetian glass jewelry: in general Venetian craft products with an optimal quality-price ratio. If you've come to Venice thinking that you won't be able to do a bit of designer shopping, think again! Just like in every major Italian city, you get the big fashion brand names here too. For label clothing shopping, the best area is that around the Piazza San Marco, where you can find Versace, MaxMara, Gucci, Armani, Louis Vuitton, Prada (and numerous more) big names. If you want to shop for clothing or accessories, though, you don't necessarily have to shop through the biggest names in fashion - in the Campo Santo Stefano and Calle della Mandola, you can get less famous or local boutiques, but you can find some excellent quality and/or unique items such as clothes, shoes, wallets, or handbags. Tourist Traps: "Coloured Pasta" and "Venetian Limoncello" (not the original napolitan one) are not Italian food, no Italian would ever eat them, they are particularly made for tourists, only buy typical regional Italian food in food shops and always check the labels to discover where they have been made. In case it is not stated on the label, avoid the purchase. L’Isola, San Marco 2970, Calle de le Botteghe, +39 041 523 1973, e-mail: [email protected]. Pauly Glass Factory, San Marco, 77, +39 041 736843, e-mail:[email protected]. Rigatieri, San Marco, 3532/36 (near Sant'Angelo and San Stefano square), +39 041 5231081. Archimede Seguso, 143, S. Marco, +39 041 5289041. Venini, S. Marco, 314 Piazzetta Leoncini, +39 041 5224045, e-mail:[email protected]. Fegato alla veneziana, chopped liver, cooked with chopped onions. Sarde in saor: fried sardines, dipped in fried onion, raisins and pine nuts, spices and vinegar. It has to marinate at least one night. Venice has some wonderful restaurants, featuring the cuisine of the Veneto. However it is widely regarded that the restaurants in Venice serve food of a quality and in quantities much lower than anywhere else in Italy. The pizza in Venice is well known as being the worst in Italy (It is a more southern Italian speciality). For Americans, you can find a place called Quanto Basta pizza that serves an American-style pizza with pepperoni and french fries. Specialties include polenta, made of corn meal; risotto with cuttlefish ink sauce. Diners should however be aware that for every genuinely wonderful restaurant or trattoria, there's another serving rubbish food at inflated prices, especially in the most touristed streets around San Marco. Rule of thumb: if there's a waiter outside pimping for business, it's probably best avoided. Near the Rialto bridge there's a row of restaurants with tables by the canal, where you can have the quintessential Venice experience of dining by the canal lights. Although they do have waiters outside bugging you, some have pretty acceptable quality for price, which is almost always expensive anyway. One of Venice's trademark foods is cuttlefish and its ink. This intense black ink serves as a sauce and ingredient for polenta (corn meal), risotto (rice), and pasta. These dishes are normally indicated by the Italian words "nella seppia" (in cuttlefish), "alla seppia" (in the style of cuttlefish), or "nero di seppia," (black of the cuttlefish). For example Polenta Nella Seppia is fried corn meal with the black ink of a cuttle fish. Despite the intensity in color, the ink has a surprisingly mild taste. Be careful when the prices are on a weight basis (typically by the "etto", abbreviated "/hg". or 100 g). One dish can easily contain 400g of fish or meat (almost a pound) - coming to 4 times the indicated base price! Restaurants might offer low prices for food on their menus that they advertise outside the entrance, but they will sometimes compensate this by charging high prices for drinks (which is naturally *not* advertised). €5 for 33 cl of beer is not uncommon. Le Bauta, an eatery on Fond del Gaffaro, is a good example. Also, please make sure that you get your change back after payment as sometimes it may be 'forgotten' by the waiters. For fresh fruit (including chilled coconut) watch out for the street market stalls. There is always a boat parked in the canal on campo San Barnaba selling fruit and vegetables into the late hours. To save money at lunch, eat standing up - that's what Venetians themselves do. Every cafe, trattoria, osteria, enoteca or whatever it chooses to call itself is stocked at lunchtime with cicchetti - Venetian tapas, including tramezzini (triangular sandwiches on white bread), bite-sized rolls with various cold cuts, polpette (fried balls of minced fish or meat) and assorted antipasti. Order by pointing at what you want on the glass shelves, and wash the whole thing down with a glass of wine (un' ombra) or a spritz (made with, in order of bitterness and alcohol content, Aperol, Campari or Select). Bear in mind that as soon as you allow yourself to sit at the table and be waited on, instead of ordering and consuming your food at the counter, the prices for the same items go up - you can end up paying double. If you look at the (government-mandated) chart of prices stapled to the wall near the bar, you'll see 2 columns of numbers, accommodating this arrangement. However, sitting is worth it if you plan on staying a while. Some places will also serve free bread and water for seated patrons, but then there is usually also a small charge (€1-3 per person) for "pane e coperto" (bread and cover charge). If self-catering, the Rialto food markets are an absolute must for fruit, vegetables and cheese, but most of all for the huge range of seafood, much of it fresh out of the lagoon and still moving! There are a variety of small stores around the city that sell fruits and vegetables, but tourists will be hard-pressed to find them. Anything else you will find in the one of the few supermarkets in the city. Head to the Dorsoduro area of Venice if you want to save a few euros. It is located on the south side of the city. It has the highest concentration of places where locals, especially students, go to eat. Generally staying away from the main squares will be the cheapest option. If you're willing and able to walk around the town, some back streets offer the best food for the lowest price. Seeing the city from this vantage point is a lot of fun too! Vecio Fritolin, Calle della Regina 2262 Sestiere Santa Croce, +39 041 5222881, e-mail: [email protected]. 12AM-14.30PM and 19PM - 22.30PM. Historical restaurant in Venice serving the best traditional Venetian cuisine, revisited with light-hearted creativity, serving up new and exciting interpretations of Venetian culinary traditions. 50€. There are a few supermarkets in the city, so if you are in the need to save some money, these are an option as they serve a wide array of prepared and semi-prepared food. On the main street from the station to the Rialto bridge there is a Coop and a Billa supermarket. Venetian snacks (cichetti) can be brilliantly inventive, in small "tapas-style" serving sizes. Look for places (especially wine bars) popular with non-tourists, the prices are very reasonable. There are still many small bakery shops and "biavaroli" where you can buy bread, cheese etc., particularly near the Rialto market area. If you want to buy water (Venice has excellent free tap water easily accessible at the numerous fountains located outside throughout the city) it is usually cheapest to get it at the supermarkets: there are Billa or Co-op stores located throughout the city, though supermarkets are often "disguised" in nondescript buildings in Venice for space limitations. Pizzeria ae Oche. A local establishment with several locations in the city. The food is plentiful and the prices reasonable. On Calle del Tintor south of Campo San Giacomo dell'Orio, In Santa Croce. Look to spend between €5-10 for a pizza depending on how exotic your selection is. Pizza al volo. Sells superb pizza by the (extremely large) slice in Campo Santa Margherita for approximately €1.80 a slice, €5 a whole pizza. It is by the fresh fish stall under a green awning. Cip ciap, Calle del Mondo Novo (by Campo Santa Maria Formosa). Also sells delicious takeaway pizza by the slice (or slab) at similar prices. They also serve very tasty mini pizzas per kilogram. The Brek. A cafeteria style restaurant that offers a menu including main meal+drink+dessert for only €5. There is one close to the train station and another at the Marco Polo airport. La Bitta, Dorsoduro 2753A, calle lunga, san Barnaba, +39 041 5230531. Meals served 6:30PM-11PM, closed in August. This busy but friendly restaurant is in the more studenty area of Dorsoduro, and attracts a mixture of locals and tourists. They have some excellent Italian dishes, which are reflected in the prices, plus they have a great selection of wines. Osteria Al Cravatte, Santa Croce 36/37 (500m east from Piazzale Roma). This little restaurant is frequented by the professors of the nearby university. Warm welcome and a good eat.Try their raw artichoke salad or their fish of the day. €40 for three-courses meal with wine. Do Farai, Dorsoduro 3278 (100m west of Cà Foscari), +39 041 2770369. Very fresh shell fish. Taste their spaghetti al dente with razor shells. Osteria Enoteca Ai Artisti, Dorsoduro 1169A, +39 041 5238944. An excellent restaurant, small but comfortable with a few tables alongside a tiny canal. Food is fresh and delicious, not too expensive. Large selection of wines. Menu changing daily. Meals from €15-25. Gianni, Zattere 918, +39 041 5237210. They are closed on Wednesdays and between Christmas and Festival. This is a very friendly family restaurant overlooking the Guidecca Canal. The wine selection is good with many available in a choice of 250 cL, 375 cL and 750 cL bottles. The interior is almost art deco and surprisingly light. It is used by a lot of regulars, both local and returning tourists. The menu starts at €8.50 pizzas and pastas. Osteria Mocenigo, Salizada San Stae (near the Mocenigo museum), +39 041 5231703. Closed on Monday. Little restaurant frequented by locals. Be sure to try their antipasti. Excellent desserts too. €40 for two-courses meal with wine. Pane Vino e San Daniele, Campo dell'Angelo Raffaele, Dorsoduro 1722, +39 041 523 7456. A short walk from the Vaporetto stop at San Basilio on the Dorsoduro. Delightful trattoria with cosy Alpine interior and piazza seating in good weather, featuring a menu of Puglian, Sardinian and Venetian specialities. No fish, excellent wines and a highly trained dessert chef, with gluten-free, dairy-free and diabetic options available on request. Good English, Spanish, French and German spoken by the friendly owners. €45 for a three-course meal with wine, water and coffee. Timon (eno - ostaria), Fondamenta degli Ormesini (south-east of the Jewish Ghetto). Warm and local atmosphere in this little osteria where they serve great Italian vintages by the glass. If you're adventurous, try their tasty tripe. Good music inside, some table by the canal in the summer. €30. Trattoria Dai Fioi (Trattoria Dai Fioi), Via Miranese 9A, Venice Mestre(Follow Via Piave from the railway station), +39 041 983395, e-mail:[email protected]. 7 days a week. Small trattoria offering dishes with products sourced from the local area of Venice, Italy. €30. Al Vecio Canton. Castello 4738. Just 8 minutes from Piazza San Marco (200 m NE), this small and atmospheric restaurant/pizzeria will absolutely enchant you. Famous for its traditional style pizza and seafood pasta, you will not only get it all at affordable prices (pizza from €6, pasta from €8, wine from €5/half litre), but you're also served by a most friendly and hearty staff. They top it off with a free home made digestivo (mostly vodka and lemon) at the end of your meal, just to make 100% sure you'll be coming back for more. Trattoria Veneziana, Sestiere Santa Croce, 285 (200m SE of Piazzale Roma), +39 041 710749. Warm welcome, good cooking (try their mixed grilled fishes), frequented by locals and tourists. €35 for two-course meal with wine. Antico Dolo, San Polo 778. An old seafood restaurant close to Rialto bridge: food comes from the adjacent Rialto Market daily. A complete dinner excluding wines could cost €35 each more or less. Al Giardinetto, Castello 4928. Just behind the Piazza San Marco, this restaurant has a large private courtyard welcoming guests during good season. Seafood courses and Venetian specialities are served by Severino family. Vino Vino (between La Fenice Opera House and via XXII Marzo), +39 041 2417688, e-mail: [email protected]. Open non-stop from 11:30AM to 11:30PM. Offers typical Venetian cuisine and snacks at medium prices. The largest selection of top-quality Italian and imported wines (over 350) available by the glass or by bottle. Close to St. Mark's Square, it is a unique place that can exist only in Venice, where backpackers chat with baronessas, gondoliers with golfers, and where Venetians discover new vistas. Il Refolo, S. Croce, 1459, +39 041-5240016. Nice restaurant at a small piazza. Very good pizza (~10€) as well as a decent menu. €60 for a four-course meal with wine. Antico Martini, Campiello della Fenice, S. Marco 2007, + 39 041 5224121 or 041 5237027, fax: + 39 041 5289857, e-mail:[email protected]. Open all days. (Since 1720) A luxury restaurant, favorite among the famous names of culture and business, the Antico Martini also attracts expert gourmets and famous personalities since the 1800s who come to enjoy unforgettable flavors. Beautiful detail and restaurant decor, romantic atmosphere. Restaurant Antiche Carampane, San Polo 1911, +39 041 5240165.In the heart of Venice, only steps away from the Rialto Bridge, is this renowned restaurant where distinguished Venetian cuisine is served in a familiar setting. Restaurant La Caravella, Via XXII Marzo 2398, +39 041 5208901.Historical place, very near St. Mark's Square, known since the 60's and has become a must if you like traditions. Open every day all year round, offers, together some typical dishes a large selection of wines. From May to September service is in a traditional courtyard. Pasticceria Tonolo, Dorsoduro 3764/5 (Crosera San Pantalon, 400m east of Piazzale Roma), +39 041 523 7209. An 120 year old patisserie. Taste their cake with crystallized fruits or their marzipan cake. Bar Pasticceria Gilda Vio, Rio Marin 784, S. Croce. Best tiramisù, at least in S. Croce. You will find ice cream all over the city, and you will hardly survive a hot summer day without. Prices are €1.00-1.50 for one scoop, €2.50-3.50 for three scoops. Alaska, S. Croce 1159 (close to the railway station), +39 041 00715211. 14-24 roughly. Ice cream made with natural ingredients by Carlo Pistacchi, not only the owner but an artist, a poet and a philosopher. Try a Spritz (with either Campari, Select or Aperol mixed with Prosecco wine and Seltzer), a typical drink loved by all Venetians that's usually drunk while eating cicheti. You can find it in almost every bar in the city. Price is about €5, more in a touristy place. If you try the famous Veneto Grappa be careful — it is brandy containing 30 to 60 percent alcohol. The Bellini was invented in Harry's Bar in Venice. It is a mix of white peach juice and Prosecco (the ubiquitous Venetian Champagne-like sparkling wine). Fermented at a low temperature Prosecco develops amylic aromas (fruit drops), though these perhaps mix better with fruit juices than does the more austere Champagne. Classic Bellinis should never be made with Champagne. Although by normal standards expensive, a Bellini in Harry's Bar (€17 for a 1.5 oz drink is obscene) is still much cheaper than on the terraces of similar '5-star' establishments in the city. Beer in a small pub is about €5 for a pint (birra media). Espresso, the real Italian, is about €1 at the bar, €2 at a table. Coffee is everywhere in Venice, and both Venetians and the tourists avail themselves of the opportunities, usually by downing a quick dose at the counter (see warning about sit-down prices above). Rule of thumb: the bigger (and shinier) the espresso machine, the better the result. E Rosa Salva: One of the favorites is the mini-chain "E Rosa Salva", with three locations in the center - on C. Fiubera (from Piazza San Marco, take the underpass in the middle of the arcade, cross the bridge and take second right off C. Fabbri), Merceria S. Salvadore (off the campo of the same name), and right on Campo San Zanipolo (to the right of the church looking from the canal); the last one is a gelateria as well. For your €1 you'll get exactly 2 and a half sips at the bottom of a small cup, with rich crema and no bitterness. Assorted house-made sweets are €1.10. Caffe Paolin, Santo Stefano, San Marco 3464, +39 041 5220710. Doge's Palace (Palazzo Ducale), Piazetta San Marco 1 (San Marco Square) (vaporetto line 1 or 2 to San Marco), +39 041 2715911. Nov to Mar 8.30 to 17.30, Apr to Oct 8.30 to 19.00, closed Jan 1 and Dec 25. Don't miss the guided tour named Secret Itinerary, which will let you discover the part of the palace where the city's administration worked, as well as Casanova's jail and the wonderful five hundred year old roof structure. €20, Reduced €14. Bell tower of St. Mark (Campanile di San Marco), Piazza San Marco (vaporetto line 1 to San Marco), +39 041 5224064. Nov to Mar 9.30-15.45, Apr to Jun, Oct 9-19, Jul and Aug 9-21. The current tower dates from 1912; an exact replica of the previous tower which collapsed in 1902. The top of the tower offers great views of Venice and the lagoon. €8.00, children € 4.00. Clock tower (Torre dell'Orologio), Piazza San Marco (vaporetto lines 1-2-5, 1.5.2 to San Marco), +39 041 5209070. Having been closed for restoration for many years, the restored astronomical clock is now visible. The fascinating tour of the clock mechanism (and rooftop bell) can only be visited on a guided tour, in English: Mon, Tue, Wed at 10 and 11 am, on other days at 2 and 3 pm., in French Mon, Tue and Wed at 2 and 3 pm, advance reservation required online or by phone at +39 041 5209070 12.00, reduced € 7.00. Scuola grande di San Rocco, Frari (vapöretto line 1 or 2 to San Tomà), +39 041 5234864. 9.30 AM - 5.30 PM, closed Dec25, Jan1, Easter Sunday. A masterpiece of Tintoretto, this guild house is an exquisite example of Mannerist art at its best. In order to allow a comfortable admiration of the detailed ceiling, mirrors are offered to the visitors. Cycles of allegories, life and passion of Christ, scenes from the Old and New Testament. €10, Reduced €8 (2014). Jewish Ghetto of Venice. While racial and ethnic neighborhoods had existed prior to the Venetian Ghetto, Venice's ghetto was the first "ghetto" (coming from a Venetian word for the Iron Foundry that was on the site previously) and "ghetto" eventually came to mean any neighborhood that was made up of a single ethnic/racial group. Today, Jewish life is still very active in the ghetto, and elsewhere in Venice, and is home to five synagogues. Visiting on Saturdays or late Fridays (the Jewish Sabbath) will prove very fruitless because all shops, restaurants, and other Jewish places will be closed. Don't miss the Rialto market and the Rialto Bridge (Italian: Ponte di Rialto) on San Polo, the smallest sestiere. The Rialto market is for shoppers. To the east is a neighborhood of small shops and restaurants; to the west is the Rialto farmers' market. Shopping is slightly less expensive than in the tourist-filled Piazza San Marco. The bridge has become one of Venice's most recognizable icons and has a history that spans over 800 years. Today's Rialto Bridge was completed in 1591 and was used to replace a wooden bridge that collapsed in 1524. Zattere. It's a long and sunny walk along the Giudecca canal, protected during winter time from cold northerly winds for being exposed to south and shielded by buildings. You might find interesting to see how a gondola is made, stopping by the Squero (Venetian for small ship yard) across the canal near San Trovaso Church. It's one of the few still in business in town. With some luck, you'll see some gondole through various manufacturing steps (note that gondole are not straight to counterbalance the gondoliere push). When photographing bridges, do not expect people crossing the bridge to stop and wait for you to take a photo. Although San Marco is free, other famous churches charge an entry fee. If you plan to visit three churches or more, you are better off buying the churches pass. There is also a combined pass for museums, churches and transportation only available at the tourist information office but it is relatively expensive. Saint Mark's Basilica (Basilica di San Marco), Piazza San Marco (Water lines # 1, 52, and 82 will take you from Santa Lucia (the train station) or Piazzale Roma to Piazza San Marco. Walking is another option but will require a map and lots of time and energy. ), +39 041 5225205 (procuratorial phone number). 1st October to 31st March: 9:45AM-4:45PM; 1st April to 30 September: 9:45AM-5PM.Saint Mark's Basilica is on the Piazza San Marco and is one of the highlights of a visit to Venice. As with most churches in Italy, you must be dressed appropriately to be allowed in; this means no short skirts or bare shoulders. You are not allowed to carry large bags or rucksacks inside, sometimes even small daypacks may need to be deposited. Storage is available just around the corner from the main entrance (free of charge). Filming and photography is forbidden so be prepared in advance. The visit within the basilica lasts ten minutes. Waiting for entry into the basilica can last up to five or so hours and it may be wise to use a ticket service to reserve your visit (reservation costs €2, official tickets at venetoinside.com). Once you have a reservation you can take the group entrance on the left, where you hand in the printout of your reservation.Admission to the basilica is free, however, the museum upstairs costs €5 and to view the high altar and treasury costs €2 and €3 respectively. San Giacomo di Rialto. This church is possibly the oldest church in Venice built around 421. It is most recognized for its 15th century clock above the entrance of the church. It is also recognized for the red pillars and beautiful gold accents around the church itself. San Giovanni e Paolo (San Zanipolo). A fine, huge Dominican church with the tombs of many Doges. It shares its piazza with the fine Renaissance façade of the Scuola San Marco and an equestrian statue of the mercenary (condottiere) captain Bartolomeo Colleoni. Look out for the testicles (coglioni in Italian - it's a lousy pun) on his coat of arms! Santa Maria Gloriosa dei Frari (Basilica dei Frai). week-days 9 to 17.30, Sun and holidays 13 to 17.30. The big friary church, fine example of Venetian Gothic architecture, with fine monuments and paintings of Titian, Belliniand Donatello, among which the famous 'Assunta' by Titian. : €3,00. Santa Maria dei Miracoli. A perfect jewel box church, simple in form but ornamented with fine exterior marble facings. San Simeone Piccolo. The last church built in Venice. It is located across from the Grand Canal in front of Santa Lucia Train station. One of the things that it is recognized for is the fact that they celebrate Tridentine Mass on Sundays. It is also recognized for it's dome because it is used to make the church look taller than it is and the dome itself is entirely covered with lead sheet. Santa Maria della Pietà. A church that used to house an orphanage and hospital in the 18th century, currently known among classical music enthusiasts as the church where the Catholic priest and composer Antonio Vivaldi worked for most of his career. Convento di S.Francesco del Deserto, S.Francesco del Deserto. 9-11, 15-17, closed Mon. Old Franciscan convent in one of the most beautiful islands in the Venice lagoon admission free, donation. S. Francesco della Vigna, Campo San Francesco della Vigna, Castello, +39 041 5206102. 8-12, 16.30-18. Gesuati (S.Maria del Rosario), Fondamente Zattere delle Gesuati, Dorsoduro, +39 041 5230625. 8-12, 17-19. Gesuiti (S.Maria Assunta), Campo dei Gesuiti, Cannaregio, +39 041 5286579. summer 10-12, 17-19, winter 10-12, 16-18, closed Sun afternoon. S. Giobbe, Campo San Giobbe, Cannaregio. 8.30-12, 15.30-18. S. Giovanni in Bragora, Campo Bandiera e Moro, Castello, +39 041 5205906. 6-11, 17-19. S. Giovanni Crisostomo, Campo San Giovanni Crisostomo, Cannaregio, +39 041 5227155. 7-12.30, 15-19. S. Giuliano, Campo di San Giuliano, San Marco. S. Maria del Carmelo (Carmini). S. Maria Formosa, Campo Santa Maria Formosa, Castello, +39 041 5234645. 8.30-12.30, 17-19. S. Maria della Salute, Campo delle Salute, Dorsoduro, +39 041 5225558. 8.30-12, 15-17.30. S. Michele in Isola, Isola San Michele. SS. Redentore, Fondamente della Croce, Giudecca. S. Salvatore, Campo San Salvatore. S. Sebastiano, Campo San Sebastiano, Dorsoduro, +39 041 5282487. S. Stefano, Campo Santo Stefano, San Marco 3825, +39 041 5222362. S. Zaccaria, Campo San Zaccaria, +39 041 5221257. 10-12.16-18. San Michele Cemetery (Cimitero di San Michele), Isola di San Michele(vaporetto line 4.1-4.2), +39 041 7292811. Apr to Sep 7.30 t0 18, Oct to Mar 7.30 to 16.30. Cemetery established following Napoleon Bonaparte's edict of 1804, part of the European circuit of monumental cemeteries. The Russian ballet dancer Serge Diaghilew, the Austrian physicist Christan Doppler, the American poet Ezra Pound, the Russion composer Igor Stravinsky and the German-Italian coomposer Ermanno Wolf-Ferrari are buried in San Michele Cemetery. admission free. Leonardo da Vinci in Chiesa di San Barnaba [www] shows around forty models of machines reproduced from Leonardo's codices. Some of the exhibits are interactive and copies of the codices are available for further reading. Dorsoduro 2771, opening hours 9:30 - 19:30; it was supposed to have ended in 2012, but doesn't appear to be in a hurry to leave - and a good thing too, since the church, an attraction in itself (it's the one under which Indiana Jones finds catacombs in The Last Crusade, by the way), was rarely accessible to visitors before. €8. Marciana National Library (Sala Monumentale della Biblioteca Nazionale Marciana), Piazetta San Marco 7 (vaporetto line 1 or 2 to San Marco), +39 041 2407211. 8.15 to 10, 17 to 19. Buildings by Sansovino, most important collection of books in Venice € 4.00, reduced € 2.00. State Archive (Archivo di Stato), Frari, San Polo 3002 (vaporetto line 1 or 2 to S.tomà), +39 041 5222281. Mon to Thu 8.10 to 17.50, Fri and Sat 8.10 to 13.50 (reading room). one fo the largest archives in the world, in an old Franciscan monastery. Manuscripts, rexts and documents related to the history of the Venetian Serenissima admission free. Giovanni Caboto (John Cabot), Via Garibaldi 1581. Venetian explorer of North America who worked for the British (c. 1450-c. 1500). Bartolomeo Colleoni, Campo SS.Giovanni e Paolo. Condottiere (1400–1475), equestrian statue made by Andrea del Verrocchio, Leonardo da Vinci's teacher. Claudio Monteverdi, S. Maria dei Frari. Tomb, composer (1567-1643) and champion of the early Baroque seconda pratica and then-new genre of opera. Giuseppe Verdi, Giardini pubblici. Composer of operas; Italian nationalist and national hero (1813-1901). Richard Wagner, Giardini pubblici. German opera composer (1813-1883). Jacopo Robusti (Tintoretto), Madonna dell' Orto Church. Venetian painter (1578-1594), tomb. Gentile Bellini, San Giovanni e Paolo Church. Venetian painter and official portraitist of the Doges (1439-1507), tomb. Giovanni Bellini, San Giovanni e Paolo Church. Early Venetian oil painter and the most famous of the Bellini brothers (1430-1516), tomb. Caterina Cornaro, San Salvatore Church. Queen of Cyprus (1454-1510), tomb. Paolo Veronese, San Sebastiano Church. Painter from Verona whose career was in Venice (1528-1588), tomb. The Fondazione Musei Civici di Venezia, call center 848-08.2000 offers 2 museums passes for the San Marco Museums valid for 3 months at € 16.00 (€ 8.00 reduced) granting admission to Palazzo Ducale, Museo Correr, Museo Archaeologico Nazionale, Sale Monumentali della Bibliotheca Marciana, and another museum pass valid for 6 months for € 24.00 (Reduced € 18.00) granting admission to the above mentionned museums plus Ca' Rezzonico, Mesue del '700 Veneziano, Palazzo Mocenigo, Casa di Carlo Goldoni, Ca' Pesaro, Museo del Vetro Murano, Museo di Merletto Burano and Museo di Storia Naturale. Correr Museum (Museo Correr), San Marco 52, Piazza San Marco Ala Napoleonica (on San Marco Square, vaporetto line 11-2-5, 1-5-2), +39 041 2405211. Nov1 to Mar31 10am to 5pm., Apr1 to Oct 31 10am to 7pm, closed Dec25, Jan1. Interesting collection of globes, starting from the 16th century. There is also an only library hall, an archeological museum of Roman antiques and an important picture gallery. The museum offers a tour of Venetian history. Remarkable painting gallery with masterpieces of the 14th to 16th cent from Venice, works of the Venetian sculpture Canova, studies on urban development and social life. At the end of your visit, don't miss the museum art cafe, with their tables on the San Marco Square. €14 (reduced €8), which also includes Doge's Palace. La Fenice Theater (Teatro La Fenice) (300 m west of San Marco square). Visit this historic theater with an audioguide (good explanations in several languages). The theater is an identical reconstruction (rebuilt in 2003) of the previous theater building that burned down in 1996. €7. Jewish Museum (Museo Ebraico), Cannaregio 2902/b (vaporetto line 1 and 2 to San Marcuola), +39 041 715 359, fax: +39 041 72 3007, e-mail: [email protected]. Hours:1 June - 30 September: 10AM-7PM 1 October- 31 : 10AM-6PM The Museum is closed on Saturday (Shabbat), during Jewish festivities, on December 25th , on 1st January and on 1 May. Objects related to the social life of the Jewish community, in two synagogues of the 16th century. Entrance to the Museum: Full price: € 3.00, Reduced price: € 2.00. Entrance to the Museum and Guided Tours to Synagogues: Full price: € 8.50, Reduced price: € 7.00. Mocenigo Palace Museum (Museo di Palazzo Mocenigo, Centro Studi die Storia del Tessuto e del Costume), Santa Croce 1992 (vaporetto line 1 to San Stae), +39 041 721798. Apr to Oct 10-17, Nov to Marc 10-16, closed Mon, Dec26, Jan1, May1. A collection of clothes dating from the 18th century. splendid interior., collection of dresses and accessories, fabrics, books, figurines in various period costumes €5, reduced € 3.50. The Peggy Guggenheim Museum, Palazzo Venier dei Leoni, Dorsoduro 701 (Located on the Dorsoduro region of Venice, to the east of the Accademia bridge, on the southern side of the Grand Canal), +39 041 2405411, fax: +39 041 5206885, e-mail: [email protected]. Hours: W-M: 10AM-6PM. Closed on Tuesdays and on 25 December. Open on national holidays (including Tuesdays). The Peggy Guggenheim Museum offers a personal collection of modern art collected by Peggy Guggenheim. Peggy was an American married to modern artist Max Ernst, and funded a number of his contemporaries. The gallery includes a sculpture garden and works by Picasso, Kandinsky, Tanguy, Duchamp, Pollock, Dali, and Mondrian. Admission: Adults: €12, Seniors (over 65 years): €10, Students (18 years and under or holders of valid student ID): €7. Museum of Oriental Art Ca' Pesaro (Museo d'arte Orientale di Ca Pesaro), San Stae (vaporetto line 1 to San Stae), +39 041 5241173.Nov to Mar 10 to 17, Apri to Oct 10 18, closed Mon, Dec25, Jan1, May1.Beautiful palace housing the gallery of modern art focusing on Italian art in the 19th Century as well as the Marco Polo Museum, a rich collection mainly of Asian exhibits (fabrics, clothes, armours, porcelain). €8.00, reduced € 5.50. Ca' Rezzonico Museum of 18th cent Venice (Musei del Settecento Veneziano) (vaporetto line 1 to Ca' Rezzonico), +39 041 2410100. Nov to Mar 10am to 5pm, Apr to Oct 10am to 6pm, closed Dec25, Jan1, May1.Museum of the 18th Century in Venice - attempts to revive the domestic atmosphere of Venetian nobilities.Furniture, interior decoration, paintings by Guardi, Canaletto, Tiepolo. On the third floor important paintings of the Venetian school € 8.00, reduced € 5.50. Titian: Pietà (ca 1576) Regular tickets: €9,00, Reduced- €6, Advanced reservation fee: €1.EU citizens under 18 and over 65 free. Palazzo Grassi. Campo San Samuele. Temporary exhibitions from François Pinault's Collection. Punta della Dogana, Dorsuduro 2 (on the tip between Grand Canal and Giudecca Canal, vaporetto line 1 to Salute), +39 041 2001057.Wed to Mon 10 to 19, closed Tue and Dec24. Former customs house, centre for contemporary art, permanent exhibition of works from the François Pinault Collection. Renovation by world renowned architect Tadao Ando. € 15, reduced € 10. Galleria Giorgio Franchetti Ca' d'Oro (Ca' d'Oro museum), Cannaregio n. 3932 (“Strada Nuova”) – Venezia (linea 1 to Ca d'Oro), +39 0415200345. Tue to Sat 8.15am to 7.15pm, Mon 8.15am to 2pm, Sun 10am to 6pm, closed Dec25, Jan1, May1. A collection of paintings and statues in a former palace from the 15th century. One of the best examples of Gothic architecture in Venice, sculptures, bronzes, paintings of Mantegna, Giorgione and Titian, Flemish and Dutch paintings.Normal: €8, reduced: €6. Glass Museum of Murano (Museo del Vetro). summer 10am to 6pm, winter 10am to 5pm. On Murano, the island so typical of its glasswork. Closed on 25 December, 1 January. full price € 8, reduced € 5.50. Palazzo Fortuny, San Beneto, San Marco 3780 (laterale Calle della Mandorla) (vaporetti line 1 or 2 to Rialto or S.A°ngelo), +39 041 5200995. 10am to 6pm,.closed Tue and May1. collection of paintings and lamps € 10.00, reduced € 8.00. Natural History Museum (Museo di Storia Naturale), Fondaco dei Turchi, Santa Croce 1730 (vaporetto line 1 to Riva di Biasio), +39 041 2750206. Jun to Oct 10am to 6pm, Nov to Mar Tue, Fri 9am-5pm, Sat, Sun 10m-6pm. 11 exhibition halls with sections on palaeontology, explorations and nature € 8.00, reduced € 5.50. House of Carlo Goldoni (Casa di Carlo Goldoni, Centro di Studi Teatrali), San Polo 2794 (vaporetto line q or 2 to S.Tomà), +39 041 2440317. Apr to Oct 10am to 5pm., Nov to Mar 10am to 4 pm, closed Wed, Jan1, May1, Dec25. Birthplace of Venice's most famous playwright., museum, library and theater studies center € 5.00, reduced € 3.50. Lace Museum of Burano (Museo del Merletto). summer 10am to 6pm,, winter 10am to 5 pm, closed Mon, Dec25 and Jan1. Museo Storico Navale, Ex Granai della Repubblica, Castello 2148, Arsenale (vaporetto line 1 to Castello), +39 0412441399. Mon to Fri 8.45 to 13.30, Sat 8.45 to 13, Sun closed. collection of relics from the Serenissima Republic of Venice, the Italian navy, and the ancient Arsenale shipyards, miniature models, uniforms and stadarts, collection of sea shells € 1.55. Fondazione Querini Stampalia, Castello 5252 (near Camp S.Maria Formosa, vaporetto line 1-5, 1-5-2 to San Zaccaria), +39 0412711411.Tue to Sun 10 to 18, closed Sun, Dec 25 and 26, Jan 1. Residence-museum of the Querini-Stampa family, library, picture gallery, furniture and household objects from the 16th cent onwards, important paintings by Bellini, Palma, Ricci, Tiepolo and Longhi € 10, reduced € 8. Byzantine Pictures Museum (Greek Institute) (Museo Dipinti Sacri Bizantini (Istituto Ellenico)), Ponte dei Greci, Castello 3412 (vaporetto line 1-5 or 1-5-2 to San Zaccaria), +39 041 5226581. 9 to 16.30. collection of Greek, Cretan and Venetian icons of the 14th to 18th cent € 4.00, reduced € 3.50. Mekhitarist Monastery (Monasterio Mekhitarista), Isola di San Lorenzo degli Armeni, (15.10 hrs at San Zaccaria), +39 0415260104. daily 15.25 (guided tour only). Library, collection of works, miniatures and ducoments of the Armenian history € 6.00, reduced € 4.50. Telecom Italia Future Centre, Campo S.Salvador, San Marco 4826(vaporetto line 1 or 2 to Rialto), +39 041 5213272. 10am to 6pm,. closed Dec25, Jan1. centre dedicated to telecommunication technology. The building complex includes an adjacent church with important works of art, the Refectory (which is a conference hall today), Renaissance cloisters and a small museum focusing on the evolutuion of the telephone in the last 100 years admission free. Music Museum (Museo della Musica), Chiesa di S.Maurizio, Campo di S.Marizio (near Campo Santo Stefano. vaporetto line 1 to S.M-.del Giglio or line 1-2 to Accademia), +39 041 2719012. 09.30 tp 18.30. beautiful church, collection of musical instruments, Venetian Baroque paintingsadmission free. Physics Museum Anton Maria Traversi (Museo della Fisica Anton Maria Traversi), Liceo Marco Foscarini, Fondamenta Santa Caterina(vaporetto line 1 to Ca d'oro), +39 041 5224845. 9.30 to 12.30, Wed 14 to 16, closed holidays and August. More than 200 instruments for educational and practical use, built to facilitate scientific research, conducted by physics teachers sinde the 19th cent, guided tours led by students € 2.00, reduced € 1.00. Palazzo Grimani, Ramo Grimani, Castello 4858 zona campo Sta. Maria Formosa (vaporetto line 1 or 2 Rialto or Zaccaria), +39 041 5200345(Call center). Mon 8.15 to 14.00, Tue to Sun 9.00 to 19.00, closed Dec25, Jan1, May1. A jewel of Renaissance architecture that has been opened as a Venetia civic museum recently, collections of paintings, archaeological collection of Greek and Roman artefacts, temporary exhibitions € 4.00, reduced € 3.00, combined with Accademia € 13.00, reduced € 11.00. Archaeological Museum (Museo Archaeologico Nazionale), Piazetta S.Marco 17 (Vaporetti line 1 or 2 to San Marco), +39 041 5225978. 10 to 18. collection of ancient Greek and Roman sculptures, Egyptian, Assyrian and Babylonian artefacts € 4.00, reduced € 2.00. Ca' Pesaro - International Modern Art Gallery (Galleria Internazionale d'Arte Moderne), San Stae (vaporetto line 1 ti San Stae), +39 041 524695. Nov to Mar 10-17, Apr to Oct 10-18, closed Dec25, Jan1, May1.Modern Art Collection, paitings of the 19th and 20th cent. € 8.00, reduced € 5.50. Venice Lido Planetarium (Planetario di Venezia Lido), Lungomare d'Annunzio (area ex Luna Park) (vaporetto line 1-5 or 2-6 to Lido), +39 041 731518. optical-mechanical structure, realistic reproduction of the celestial globe Sun admission free. St.Mark's Basilica Museum (Basilica di San Marco -Museo), Piazza S.Marco (vaporetto line 1 or 2 to San Marco or Zaccaria), +39 041 2708311. 9.45-16.45. visit the famous bronze horses € 5.00, reduced € 2.50. Scuola Grande di S.Giovanni Evangelista, S.Polo 2454 (vaporetto line 1 or 2 ro San Tomà), +39 041 718234. occasional 9.30 to 17.monumental staircase by Codussi, splendid San Giovanni Salon, Oratory of the Cross with precious reliquiaries € 5.00. Scuola Dalmatina di San Giorgio e Trifone, Castello, Calle dei Furlani 3259/A (vaporetto line 1-5 or 1-5-2 to S.Zaccaria), +39 041 5228828.Tue to Sat 10-12.30 and 15-18, Sun 10-12.30, closed Mon. Famous painting cycle by Vittore Carpaccio depicting the lives of St.George, Tryphon and Jerome € 4.00, reduced € 2.00. Scuola Grande dei Carmini, Dorsodure 2617 (near campo Santa Margherita) (vaporetto line 1 to Ca' Rezzonico), +39 041 5289420. 11-16, closed Dec25, Jan1. painting cycles dedicated to the Madonna del Carmine, canvases by Tiepolo and Padoviano € 5.00, reduced € 4.00. Oratorio dei Crociferi, Canareggio 4905, Campo di Gesuiti (vaporetto line 1), +39 041 5322920. open on request only, tel. +39 041 2719012.Small oratory facing the old monastery dei Crociferi, painting circle by Palma the Younger € 60.00. Museo Diocesano, P.te della Canonica, Castello 4312 (vaporetto line 1-5 or 1-5-2 to San Zaccaria), +39 041 5229166. 10-17, clsed Wed.Religiouis furniture and objects from now abolished churches and convents, one of the most appealing Romanesque cloisters of Venice € 4.00, reduced € 2.50. Ride a vaporetto (water bus) down the Grand Canal right before sunset. The vaporetti are expensive, but the sights are priceless: amazing architecture, soft seaside sunlight, and a fascinating parade of Venetian watercraft. Take a gondola if you can afford it: it's expensive, but theGondoliere may decrease the price if you ask (but they can also decrease the time...). Make sure you reach an agreement on price and time before you start! A good tip with the Gondolieres is to bargain the price down as low as you can, then say that it's still too much and walk away. Two or three of them will chase after you, one after the other, each offering a lower price than the last. It's possible to knock €20-€30 off the price(even then, be prepared to shell out €80).Some guidebooks discourage tourists from asking for gondola price reductions. The oarsmen have an informal habit of cutting the most interesting and little-known parts from the journey path for "discount" customers. Reduced rate riders get much less marvel in exchange for a moderate price drop, which may not be worth it.Gondolier-for-hire business licenses are officially limited to just 430 to 455 rowers in Venice, making the market artificially scarce and inflating prices. Gondola rides are always costly, often in a princely way and that expense should be planned in advance of the visit. If you go as a group it might be cheaper, though the number of people who can be accommodated on a gondola varies, usually up to a maximum of six seated passengers. The "traghetti" holds more, mostly standing, as a pair of gondoliers rows short distances for canal crossing purposes at a number of points along the Grand Canal.Venetians and especially the gondoliers among them have highly conservative ideas about society: by 900 years of tradition, all gondoliers must be male and most are born locals. There are only a few Germans in the business and a single lady, Alexandra Hai, who couldn't manage a for-hire license even after 10 years. She is officially allowed to carry guests of her contract hotel only. If a gondola seems a little pricey, the alternative is to cross the Grand Canal by traghetto. These only cost €2 to use and are largely gondolas that have seen better days, They are stripped down and used as municipal ferries. In the 1950s there were as many as thirty, but now there are seven points to find them. However some only operate when people are going to and from work. The length of any crossing is just a few minutes. Many visitors enjoy visiting the open air markets near the Rialto Bridge and there is a traghetto station there, at the Pescheria (fish market) joining the Santa Sophia church along the Strada Nova. You will notice that traghetti passengers tend to stand up, but if you are not comfortable doing so, sitting is possible, if you are careful. The more adventurous can try the venetian style of rowing through Row Venice or one of the many rowing clubs. If you are looking for something to do, you can always shop. Venice is packed full of little stores in every corner and crevice. The commonest local specialties are Carnival masks, glass, and marbled paper. Price can vary wildly, so it's a good idea to hold off buying until you have a fair idea about the relative value of things. As is the case with most tourist cities, a LOT of the "original " and "made in Venice" items are actually made in China.Murano is an island famous for its glass making. Almost in every shop you will find "original Murano glass" items. If it was really made in Murano, it would be prohibitively expensive, with prices routinely running into thousands of euros. So if you are looking for cheap souvenirs, real Murano glass is not the thing to buy! You can also see glass making demonstrations in Murano, but be sure to check that there is a demonstration scheduled for that day. And it is normally not done in winter either. Spend a day on the islands, mainly Murano, Burano and Torcello. There are boat services to all these islands at scheduled times, including between the islands themselves. Be prepared for long lines and long waits for the boats between islands. The Glass Museum in Murano and the Lace Museum in Burano are certainly worth a visit. In Burano you will find some of the most picturesque streets and houses, with each house sporting a different pastel shade. Its really beautiful. Though there is not much to see in Torcello except for the old church, and the supposed "Throne of Atilla". However, the peace and tranquility of the island is not to be found anywhere else in Venice! Torcello is also home to a very expensive Cipriani restaurant. But just walking around on these islands is a nice enough experience. If you've had enough of the hype and the other tourists, hop off the vaporetto at 'Cimitero', Venice's graveyard for a peaceful walk. There are many famous tombs, and the section dedicated to deceased children is particularly haunting. There is also a free toilet there. While going through Venice, make sure you take in the beauty of it all. Walkthrough the alley ways, and take the water taxi to different parts of the island, sometimes at night you can just go sit in an open area and watch locals and tourists passing by. It is wonderful. There are many museums and churches that are around the city that allow tourists to go in a visit. They are many great sights to keep you busy throughout your visit. The “Secret Itineraries in Doge's Palace” worth a visit, take the visitor into the most secret and fascinating rooms in the Palace. It’s better to book in advance. Because Venice is now pretty much only inhabited by tourists and people serving the trade, it gets very quiet by 9.00 and there is very little to do in the evening (outside of eating). There are a few exceptions, like some classical music concerts, which most probably only play Vivaldi. If you would like to have a guide to show up the highlights of Venice, you can choose between many offers. There are walking or boat tours, focused on shopping or history or for art lovers, and many itineraries. Take photos, using your camera or phone: every corner of Venice will inspire you. And if you have taken good pictures, though you may not be a professional photographer, consider entering the photo competition "OneDayInVenezia" running all year round, awarding monthly winners, and dedicated to amateur photographers. The Grand Prize is a week-end in Venice, trip included. If you are interested in exploring all things related with Italian food you have to visit the freshly open "i Tre Mercanti" (campo della guerra 2 mins from S.Marco square) an amazing food gallery where you can find typical Italian specialties, a wide range o f the best wines and the usual classics like Olive Oil, balsamic vinegar, Parmesan, Limoncello along with hundreds of regional specialities (including 97 pasta sauces!). Classy and friendly the staff speak many languages and is open every day. If you don't feel like shopping you can always browse the shop and ask cooking tips and the history of products to the helpful manager. Send a Postcard or even better, an entire mail dedicated to an important one (the old "snail mail" one, not the electronic variety)! Venice has a long, celebrated tradition in postal services, paper and written communication in general (including one of the earliest medival book printing houses). Venice it's also Riviera del Brenta old canals. The Riviera del Brenta is famous for its extraordinary Palladian villas along the Brenta river, its museums and historical buildings and it is located only 25 miles from Venice. This Riviera and its mainland include 7 small cities: Stra, Fiesso d’Artico, Dolo, Fossò, Mira, Oriago and Malcontenta. These places are indicated for cycling excusions and to see antique Palladian Villas built on the Brenta river. In Stra village the famous gardens of Villa Pisani and the museum of the shoesin Villa Foscarini Rossi. In this last museum you can admire 1500 models of made in Italy shoes created from local factories for major brands included Fendi, Genny, Yves Saint Laurent, Givenchy, Ungaro, Anne Kleyn, Richard Tyles, Vera Wang and much more. In Dolo village you can visit the square, old watermill (XI century)and big open air market. Teatro Malibran, Canareggio 5873, campo del Malibran (vaporetto line 1 or 2 to Rialto), +39 041 2424. Scuola Grande di S.Teodoro, Campo San Salvador. opera and concert performances € 40,00, reduced € 30.00. Ateneo San Basso, Piazetta del Leoncini, San Marco (vaporetto line 1 or 2 to San MArco or S.Zaccaria), +39 041 52 82 825, e-mail:[email protected]. classical concerts € 25.00, reduced € 20.00. Chiesa San Vidal, Campo San Vidal (vaporetto line 1 or 2 to Accademia), +39 041 27770561, e-mail:[email protected]. classical concerts € 26.00, reduced € 21.00. Chiesa della Pietà, Riva degli Schiavoni (vaporetto lines 1, 5.1, 5.2, 4.1, 4,.2 to San Zaccaria). € 25.00, reduced € 20.00. Scuola Grande dei Carmini, Campo Santa Margherita, +39 041 52 87 667. Tue and Sat. € 22.00 to € 50.00. Teatro San Gallo, +39 041 2412002. Nov to Apr 19.00, May to Oct 20.00. half hour documentary based on the BBC series "Francesco's Venice" - an 'amazing film that puts the spectacular beauty of this great city in historical context'. Film in English, audioguides in Italian, Russian and Spanish. € 39.00, seniors € 35.00, students € 25.00, children € 15.00. La Biennale di Venezia is one of the most well known culture institutions. Two events organised by Biennale are the Art and Architecture International Exhibitions happening alternately (Architecture Biennale in even years, Art Biennale in odd) but other fields are also covered - contemporary theatre, dance, music, cinema (Venice International Film Festival). Exhibitions take place mostly in two locations: Arsenale and Giardini. They are both worth visiting even when no event is scheduled. Arsenale is the largest pre-industrial production centre in the world, dating back to 13th century, and Giardini is architectural gem filled with national pavilions from different parts of the world, often designed by famous architects, it was a venue for the International Art Exhibition since 19th century. The Art Biennale (Esposizione internazionale d’arte) [www], tel. +329 041 5218828, e.mail: [email protected] is held at Arsenale (vaporetto line 4.1 and 4.2 to Arsenale) and Giardini (vaporetto line 4.1 and 4.2 to Giardini). The Central Pavillion and the pavilions of Australia, Austria, Belgium, Brasil, Canada, Czech Republic, Denmark, Egypt, Finland, France, Germany, Great Britain, Greece, Hungary, Israel, Japan, Korea, The Netherlands, Nordic Countries, Poland, Romania, Russia, Serbia, Slovak Republic, Spain, Switzerland, United States, Uruguay, Venezuela and the pavilion of Venice are located in the Giardini. The Biennale is open every second year from beginning of June to mid November, Tue to Sun 10 to 18, closed on Mon. Admission is € 30 (two days) (multiple entries) (ID required), € 25 (one day) (single entry to each venue), € 20 (over 65), € 14 (students). There are many other exhibitions (collateral events) all over the city, often permitting to visit buildings which normally are not open to the public. Online guides to the exhibits are not substantive. The British Council provides a comprehensive guide to all exhibits available at the British pavilion at the Giardini. The Concordia/Antarctic Exhibition has closed early. Regata Storica (Historic fleet event) is held on the first Sunday of every September. Celebrating a historic event from 1489, the regatta displays almost a hundred varieties of venetian boats from the city's rich past. Large oarships, replicating ancient roman and medieval vessels, are rowed along the Canal Grande, followed by many smaller boats. There are several races, including a master championship for solo sculling in streamlined gondolini, painted in unusual white, pink, etc. colours. There are many excellent photo opportunities for this event. Vogalonga, the yearly equivalent of a marathon run on water. Vogalonga competitors must row 32 kilometers under 3.5 hours to receive a certificate of attendance at the finish line, but everybody with a human-powered vessel is welcome to participate (some foreigner teams take up to 10 hours to complete the journey just for the fun of it). The official purpose of the Vogalonga was to protest the sharply increasing use of powerboats in Venice, but the event has gradually grown into a festival since 1974, with up to 5500 racers in 1500 vessels attending by the early 2000s. The racetrack visits different parts of Venice as well as some of the nearby islands. Locals and tourists lining up alongside rios and canals cheer the racers. Visitors wishing to participate should have serious experience in rowing or sculling and practice duely, as the journey is physically demanding (even seasoned oarsmen develop calluses by the finish line). The event is mainly for teams, completing Voga Longa on a single oar is considered a major achievement. Extreme participation (scuba frogmen and surface swimmers) sometimes occurs, but it is not recommended due to water contamination issues. There are two late-night drinking areas in Venice. Piazza San Marco is not one of them. Although it is very pleasant and there are many people wandering around late. But the actual late night scene is in either Campo Santa Margherita, near the University Ca' Foscari in Dorsoduro; or in Erbariaon the West side of the Rialto Bridge where the main vegetable market is held during the day. Although there are many fantastic bars in Venice, if you're planning a night time "pub crawl" you should plan a few places to visit in advance, otherwise it's very easy to waste an hour wandering aimlessly in search of a watering hole that's actually open (especially midweek). Locals in search of nighttime entertainment mostly head over the bridge into Mestre, or hop the boat to Lido. One exception: F.ta della Misericordia, in Cannaregio (north from the Ghetto over the Ghetto Nuove bridge, turn right), features several bars in succession, anchored by the Paradiso Perduto(Cannaregio 2640; a restaurant by day, live music on Sundays starting at 9), along the canal. In season they are spilling over after dark with youths holding large glasses of rosé, while more of those same youths are cruising (in motor boats) blaring rap songs in Italian from the loudspeakers. The cafes and bars lining the expansive C. Santa Margherita are catering to the students from the nearby university; chill out to reggae sets in Caffé Rosso (Dorsoduro 2963; it's the one with the red awning that simply says Caffe), or dance (Saturdays only) at Round Midnight (Dorsoduro 3102). Those looking for gay nightlife in Venice will be disappointed. Hop on the train to Padua instead. Devils Forest Pub. A traditional English style pub with a very fun atmosphere. It is located near the Rialto Bridge and tucked into a small alley near the Disney Store. Pub Taverna L'Olandese Volante, Campo San Lio, Castello 5856, Venezia, +39 041-5289349. It is located between The Rialto Bridge and Piazza San Marco. During the summertime there are tables outside when you can easily sit and rest after a day of wandering around this marvelous city. What is more, during the day pasta and other typical dishes are served at a budget price. There are two Irish pubs in Venice. One is located along the Strada Novain Cannaregio; the other one is the Inishark just before Campo Santa Maria Formosa. Al Parlamento, Fondamenta Savorgnan 511 (Cannareggio canal, not far from the train station). Great place for a spritz, a coktail, a beer or a glass of wine looking at the Cannaregio canal. €6 cocktails. The unfortunate side-effect of the quaint back-alleys which make Venice such a delight to visit is that it is remarkably easy to get lost. Even maps provided by hotels are frequently inaccurate, and the maze-like structure of the city can become very confusing indeed. The tight cluster of little islands that comprise Venice is completely surrounded by the Lagoon, so it is not possble, no matter how lost you become, to leave Venice on foot. Sooner or later you will come upon a piazza that you can locate on your map. One tip: as you cross bridges, note the house numbers before and after. A small change probably means you are on the same island/district and have crossed a "new" canal. A major change means you are now on another island. Most maps clump islands together into their voting districts, there are many more islands than districts. One piece of assistance is to look for directional signs. These will be marked "Per" and then with the name of a prominent location or bridge in the city, complete with an arrow pointing in the relevant direction. Hence, to get to the Rialto bridge, the signs to follow are marked "Per Rialto". Those to St Mark's Square read "Per S Marco", and those to the train station "Per Ferrovia" (there are some others as well). Having oriented yourself to the nearest landmark, direction-finding can thus become (slightly) easier. Remember, though, that the signs to read are the official ones. Graffiti will occasionally give other directions, frequently incorrect ones. That said, some argue that getting lost in Venice is part of the experience of the city. The number of photogenic canals, hidden restaurants and shops where glass blowing is done almost guarantees that there is no such thing as a "dull neighbourhood". Additionally, the public transport means that it is relatively easy to arrive at the intended destination even after one has emerged from the web of alleys in a totally unexpected place. Venice is considered a safe city. You have to take the habitual travellers' precautions however. Keep your valuable items (like wallet and passport) close to you because there are pickpockets, especially in more crowded parts of the city. In case of need, you can dial free of charge on any phone 112 (no area code needed) to contact Carabinieri or 113 (no area code needed) to contact the Police. Venice has begun to install septic tanks in buildings, but much of the city has not yet been upgraded and releases untreated sewage directly into the canals. Avoid bathing yourself, touching the water, immersing feet, etc. in the canals looking for refreshment in hot season. Also, at night there is a risk of falling into the water, as there are many alleys which end in the water but have little or no lighting. In the warmest months, these conditions can sometimes generate foul odors. Choose other times to visit if they might ruin what should be a highly enjoyable stay. You can reach the emergency medical service dialing free of charge on any phone 118 (no area code needed, conversation will be recorded) to have assistance and an ambulance sent to you. Chemists' shops (Italian: Farmacie) are all around the town. They are open 24hrs. a day, 7 days a week on a rotational basis: outside the shop there's always the list of operating ones with time-table, address and phone number. If you need a special drug you might be asked to book it in advance if it's not in common use. Note that the commercial name or brand of your prescription might differ from your country of origin, and make sure that the medication you want is available in the EU.